Detail of building work showing wooden supports possibly at Jedburgh Abbey. General view of Jedburgh Abbey from SE. 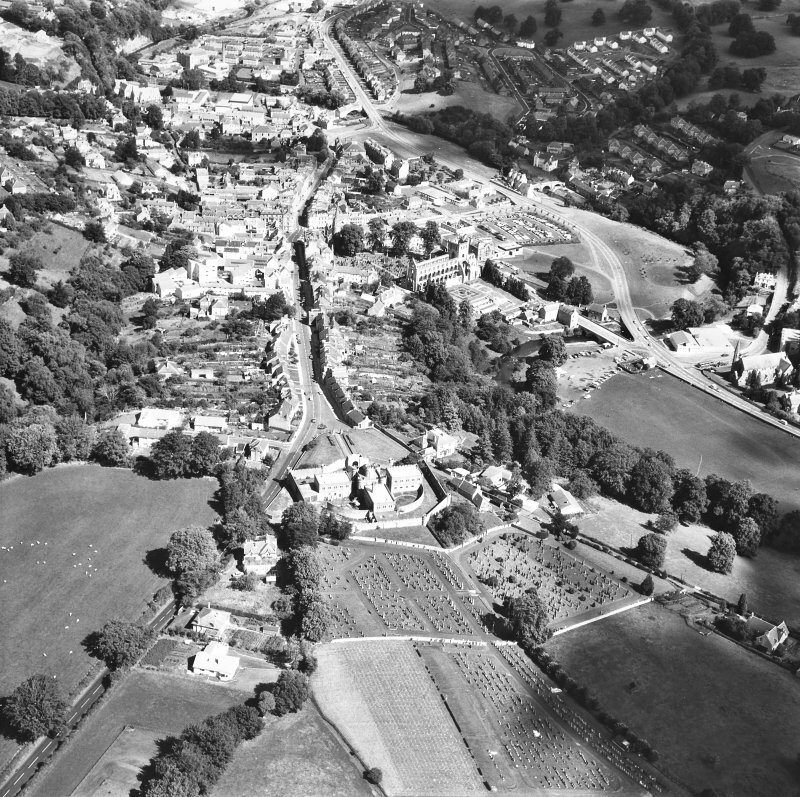 Oblique aerial view centred on abbey from S.
Oblique aerial view centred on abbey from SW.
Oblique aerial view of Jedburgh centred on the abbey, taken from the WNW. 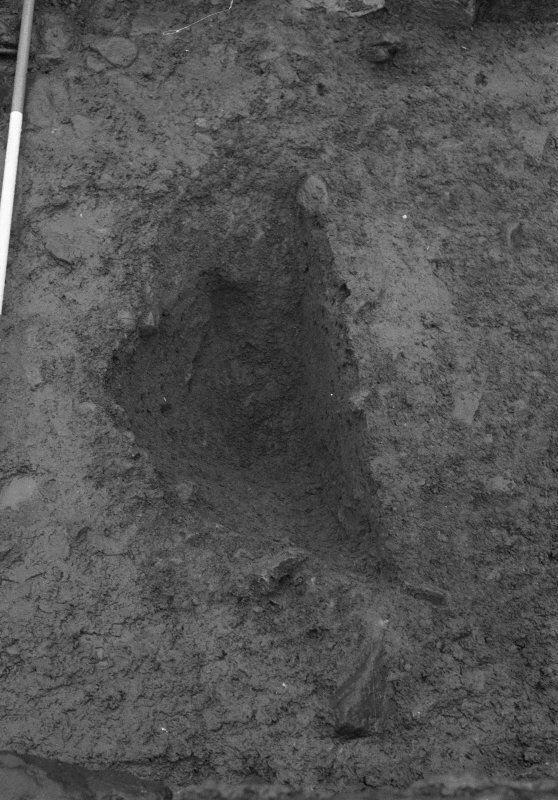 Jedburgh Abbey excavation archive Frame 36: Area 2: Trench G: W-face of sondage 544. 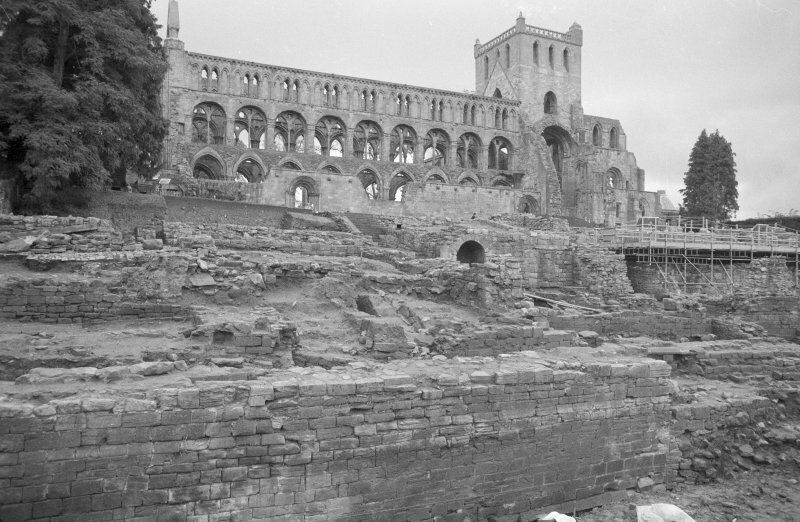 Jedburgh Abbey excavation archive Frame 31: Area 2: Trench F: 516. 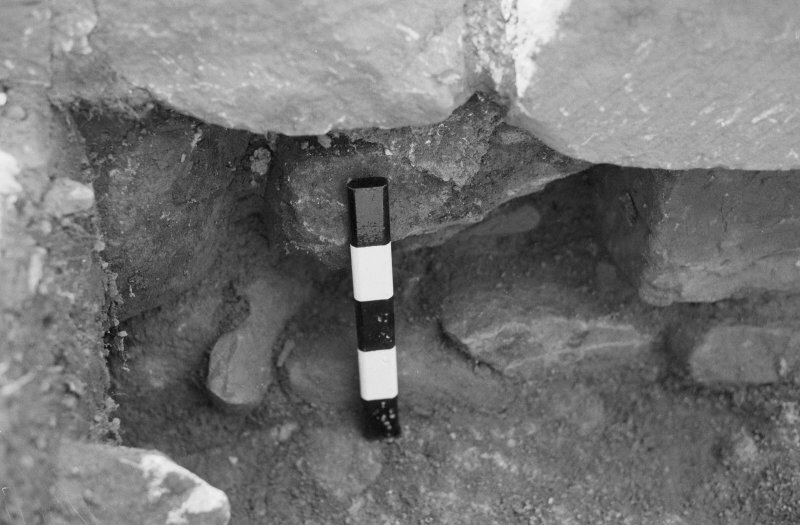 From S.
Jedburgh Abbey excavation archive Frame 18: Area 2: Trench F: Stone displaced from 486, mortared to 373. 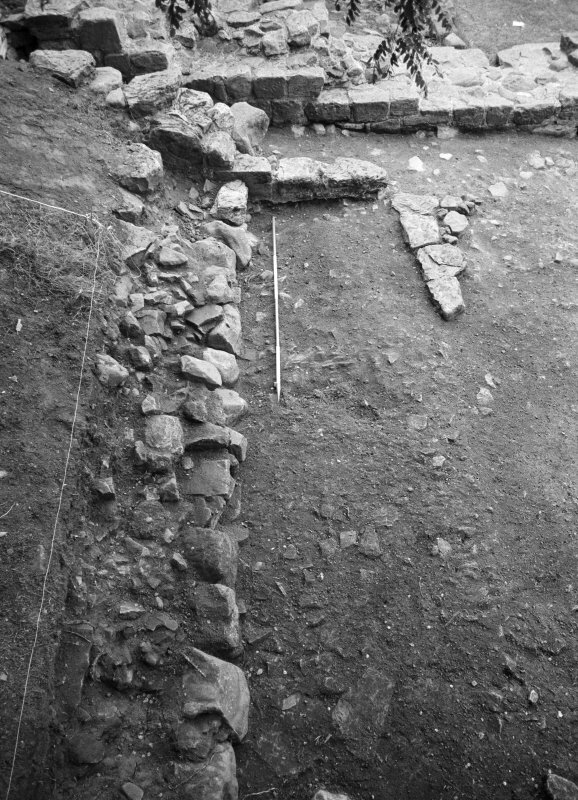 From S.
Jedburgh Abbey excavation archive Frame 37: Area 2: Trench G: 526 excavated, with robbing 377 and wall 385 in foreground. 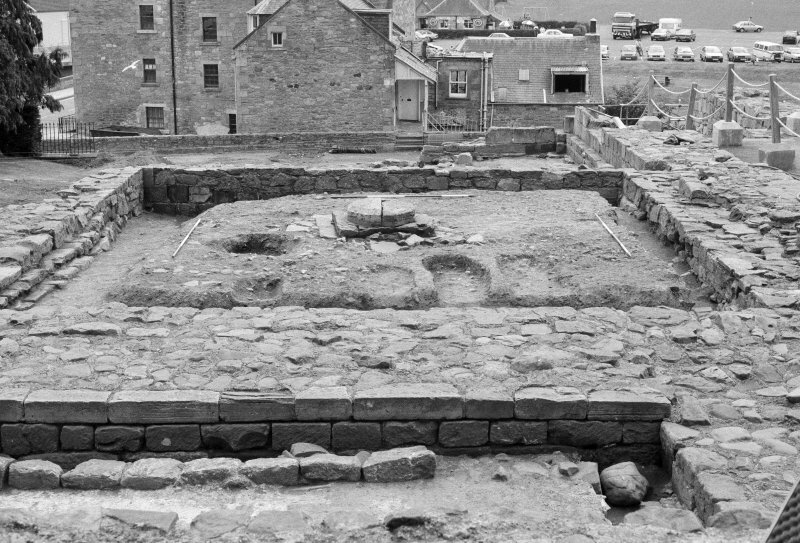 From S.
Jedburgh Abbey excavation archive Frame 30: Area 2: Trench G: E extension (S of infirmary) after first clean. 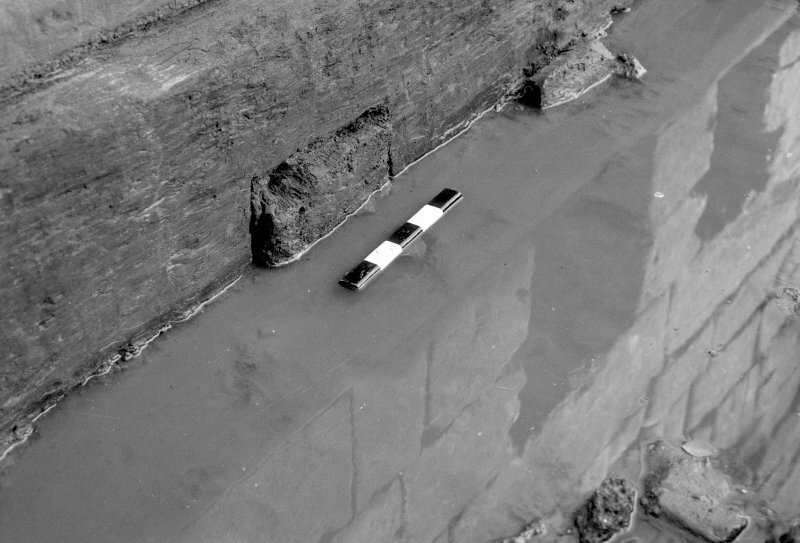 From above / N.
Jedburgh Abbey excavation archive Frame 35: Area 2: Trench E: Midden 510 over drain 357, W end of trench. 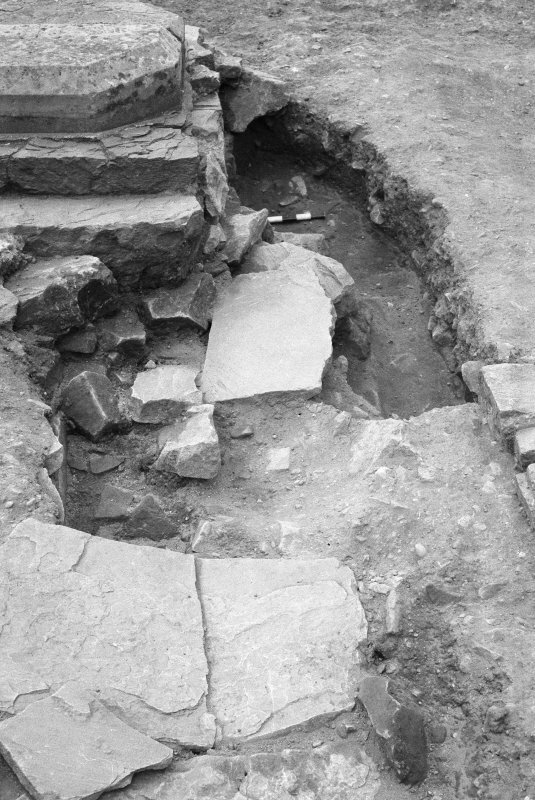 From N.
Jedburgh Abbey excavation archive Frame 34: Area 2: Trench E: 422 partially excavated. 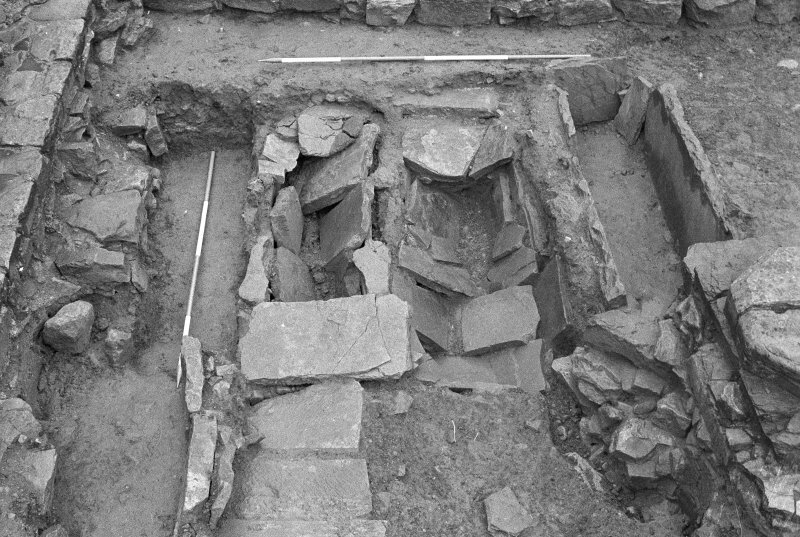 From N.
Jedburgh Abbey excavation archive Frame 33: Area 2: Trench E: 422 partially excavated. From N.
Jedburgh Abbey excavation archive Frame 11: Area 2: Trench E: 447 and 508 pre-excavation with 422 at top of picture, 375 at bottom. 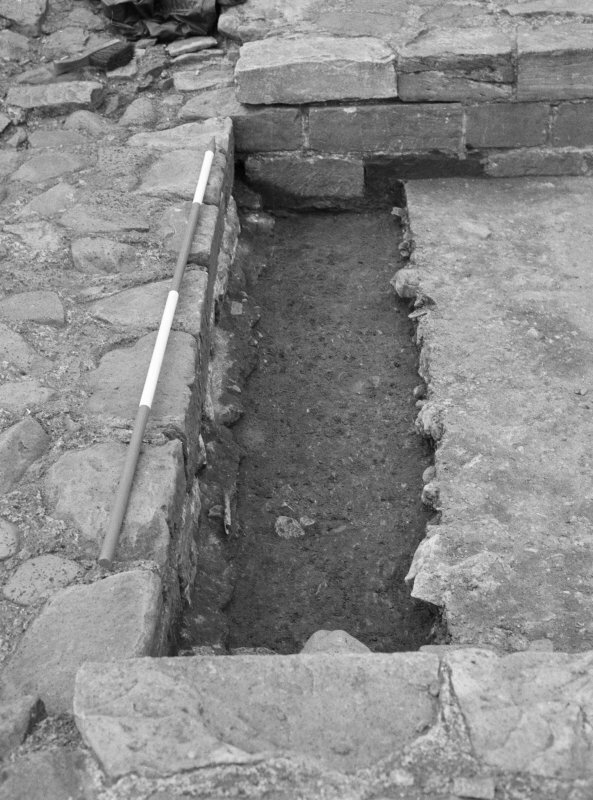 From S.
Jedburgh Abbey excavation archive Frame 36: Area 2: Trench G: 386 drain. 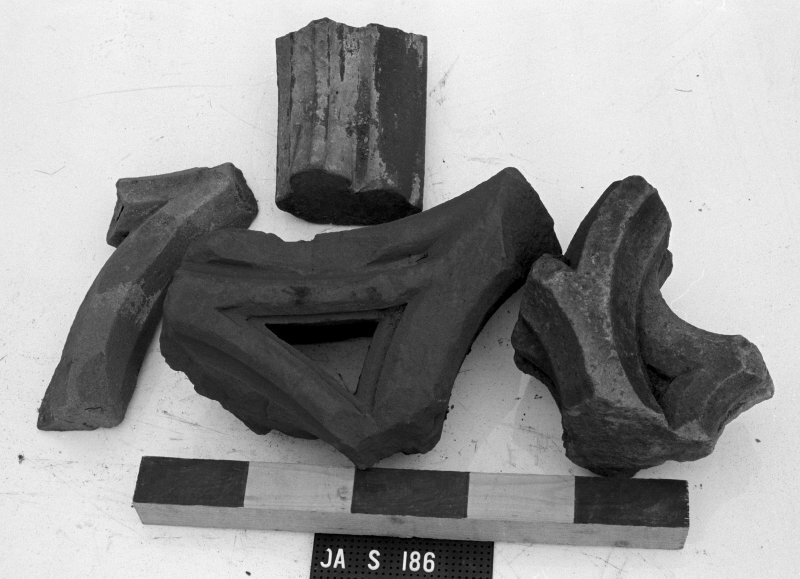 From S.
Jedburgh Abbey excavation archive Frame 18: Area 2: Trenches D and F: 480 mortar spread. Work in progress. 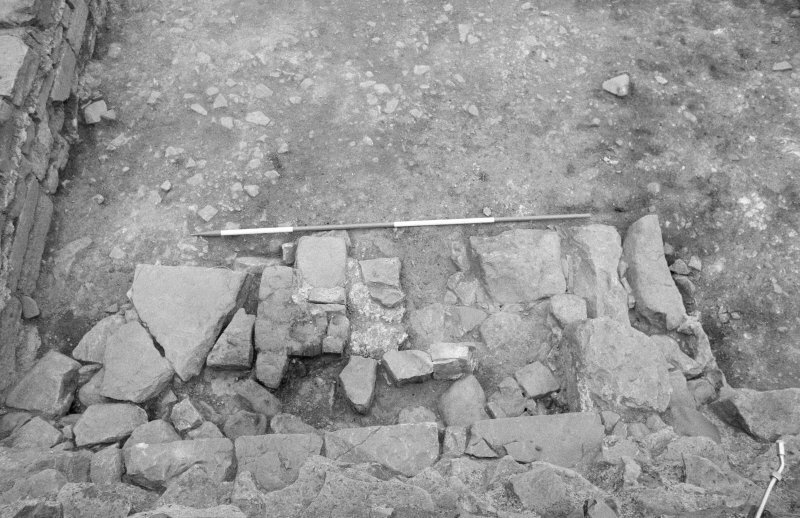 From SW.
Jedburgh Abbey excavation archive Frame 29: Area 2: Trench D: 465 partially excavated. 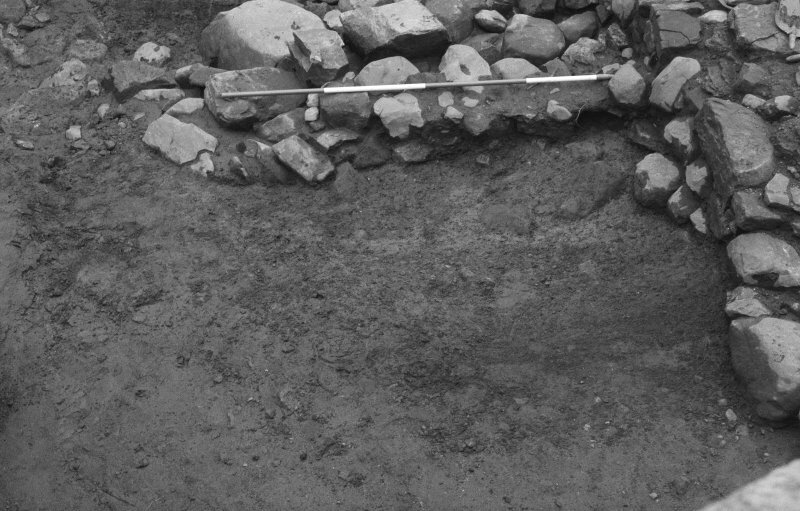 From S.
Jedburgh Abbey excavation archive Frame 4: Area 2: Trench E: Shallow depression 455. 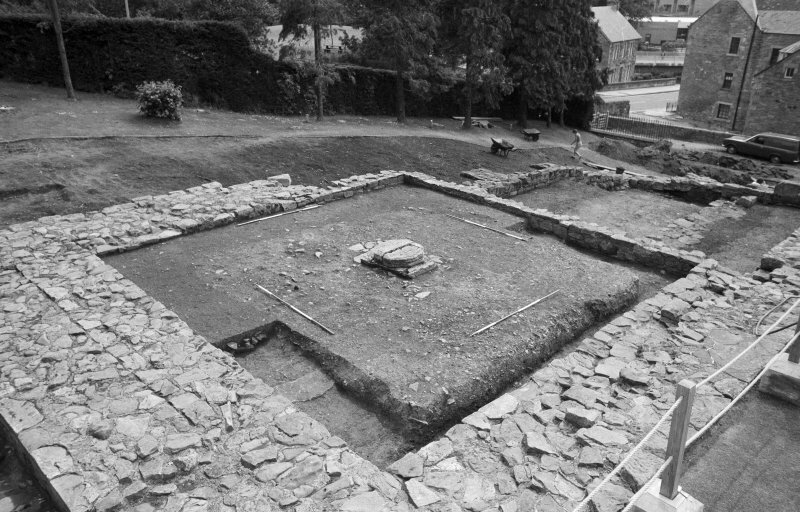 From SW.
Jedburgh Abbey excavation archive Frame 21: Area 2: Trench D. General view. 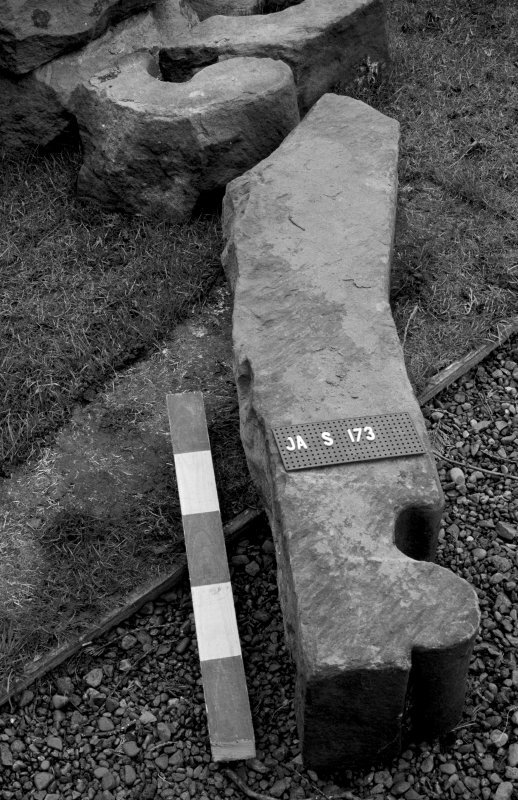 From E.
Jedburgh Abbey excavation archive Frame 30: Area 2: Trench E: Posthole 452 half-sectioned - wider view. From SE. 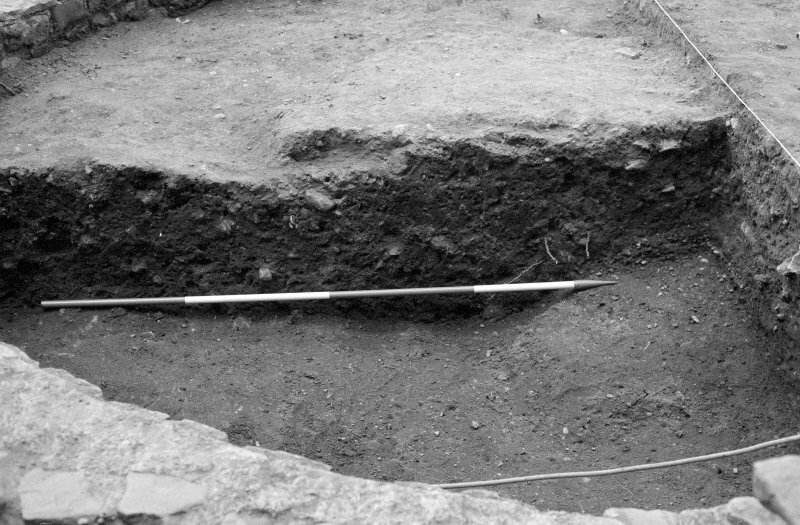 Jedburgh Abbey excavation archive Frame 29: Area 2: Trench E: Posthole 452 half-sectioned. 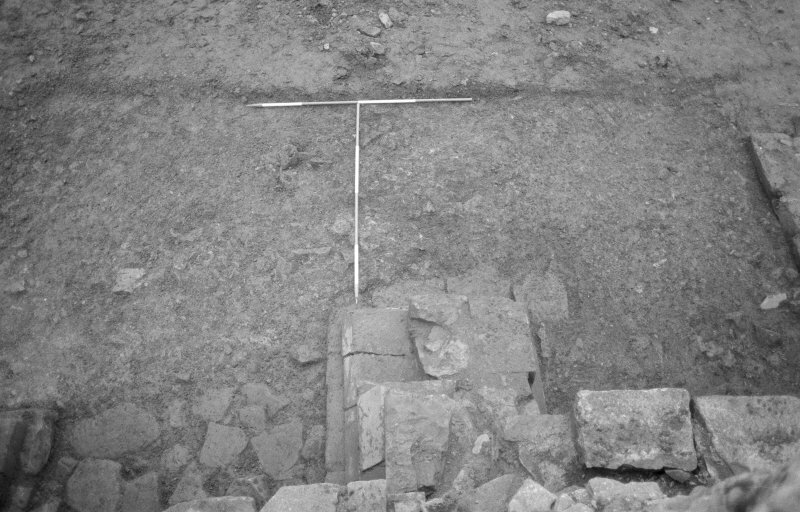 From E.
Jedburgh Abbey excavation archive Frame 25: Area 2: Trench E: E end of trench, showing, among others, 422. From NW. 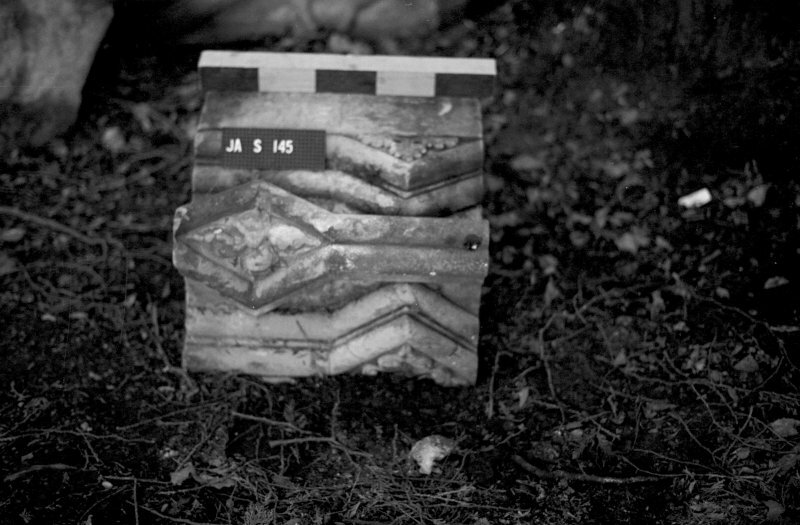 Jedburgh Abbey excavation archive Frame 16: Area 1: unidentified. 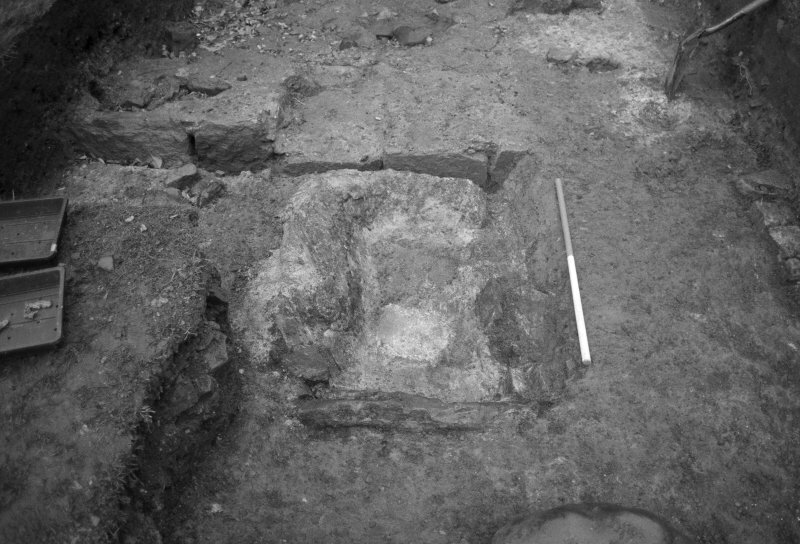 Jedburgh Abbey excavation archive Frame 13: Area 1: unidentified. 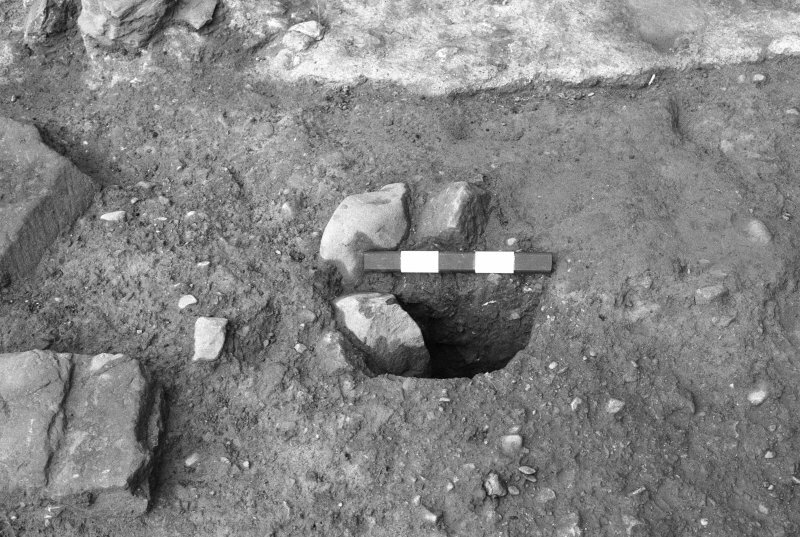 Jedburgh Abbey excavation archive Frame 33: Area 1: Room 3: Capstones 238 of Grave 829 and plinth foundations 220. 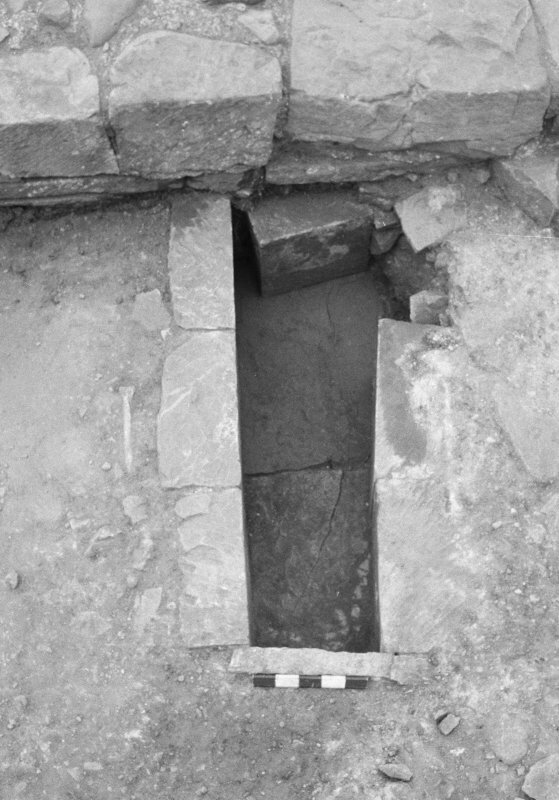 From E.
Jedburgh Abbey excavation archive Frame 37: Area 1: Room 3: Coffin outline of Grave 290. 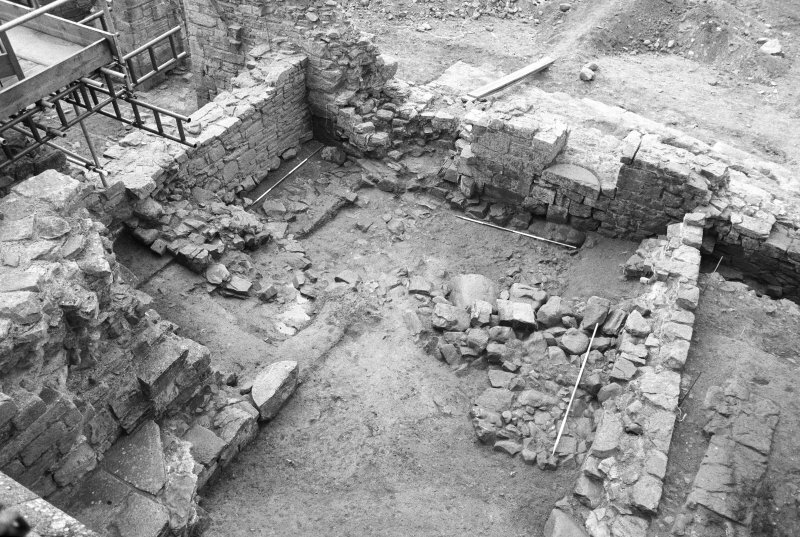 Jedburgh Abbey excavation archive Frame 30: Area 1: Room 3. 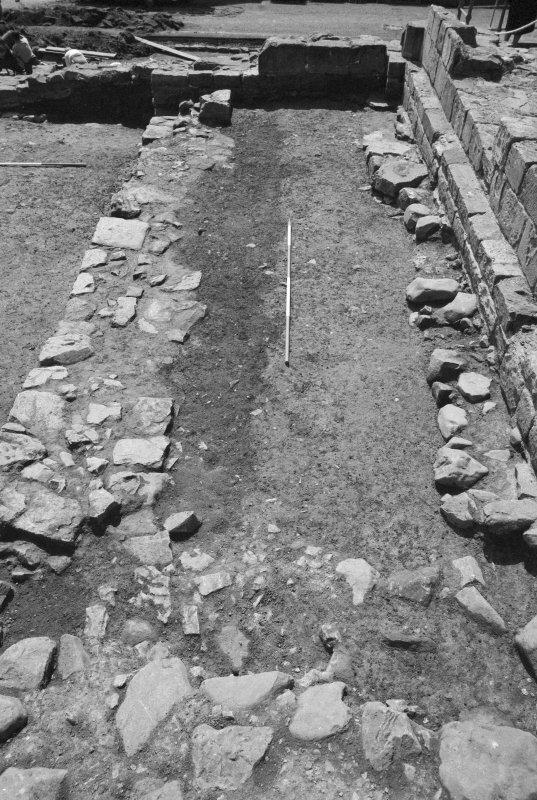 From W.
Jedburgh Abbey excavation archive Frame 27: Area 2: Trench E: E half of trench, viewed from N, after first clean. 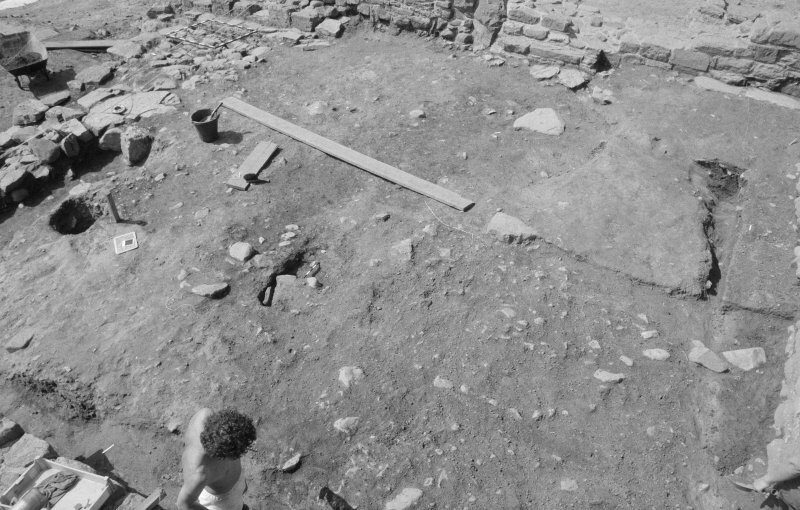 Jedburgh Abbey excavation archive Frame 36: Area 1: unidentified. 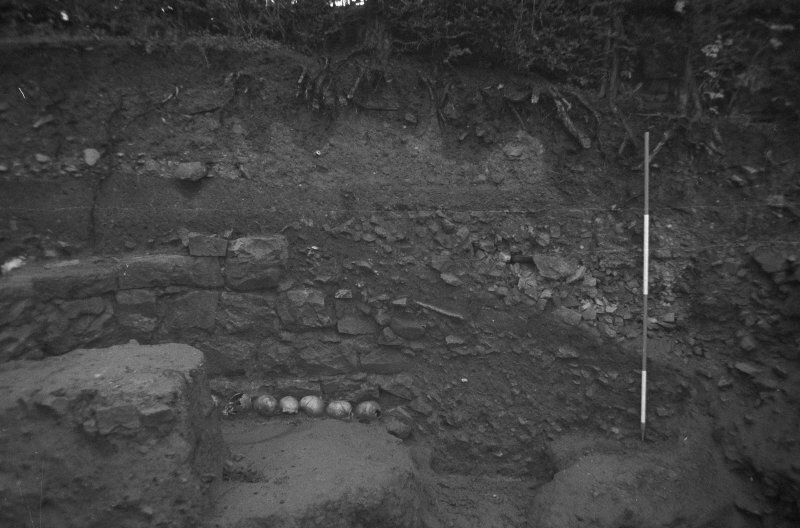 Jedburgh Abbey excavation archive Frame 35: Area 1: unidentified. 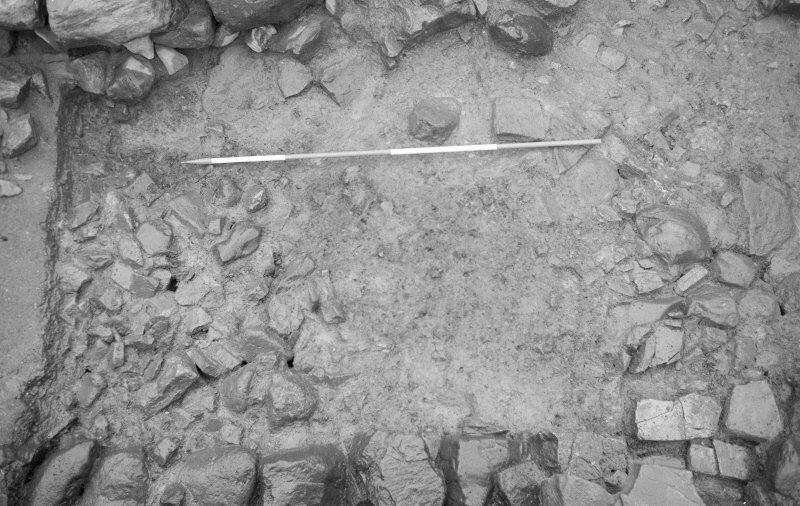 Jedburgh Abbey excavation archive Frame 32: Area 2: Trench C: 333, section. 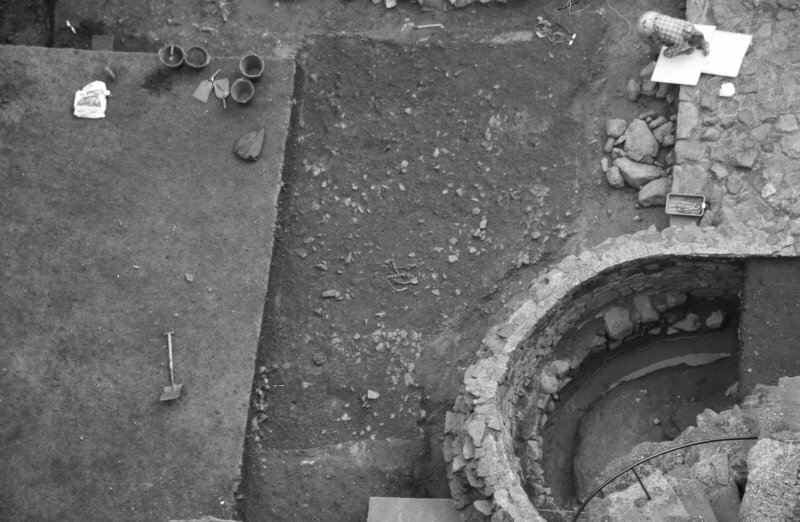 Jedburgh Abbey excavation archive Frame 21: Area 1: unidentified. 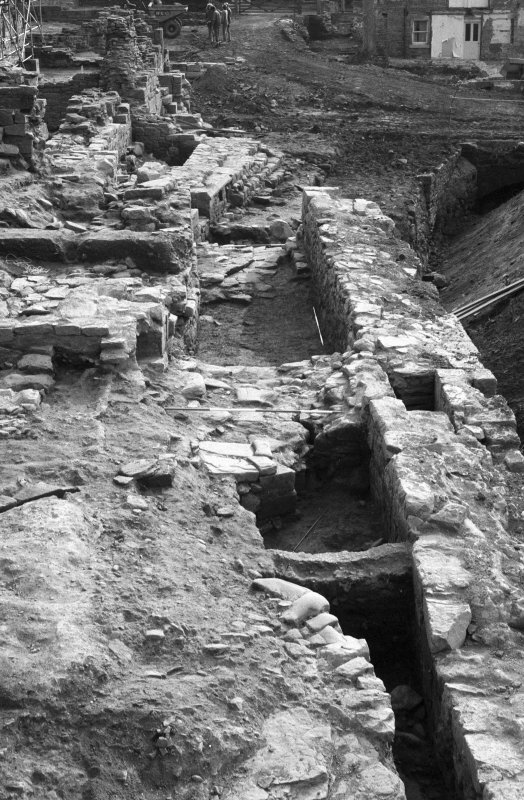 Jedburgh Abbey excavation archive Frame 30: Area 2: Trench A: 303 partially removed. 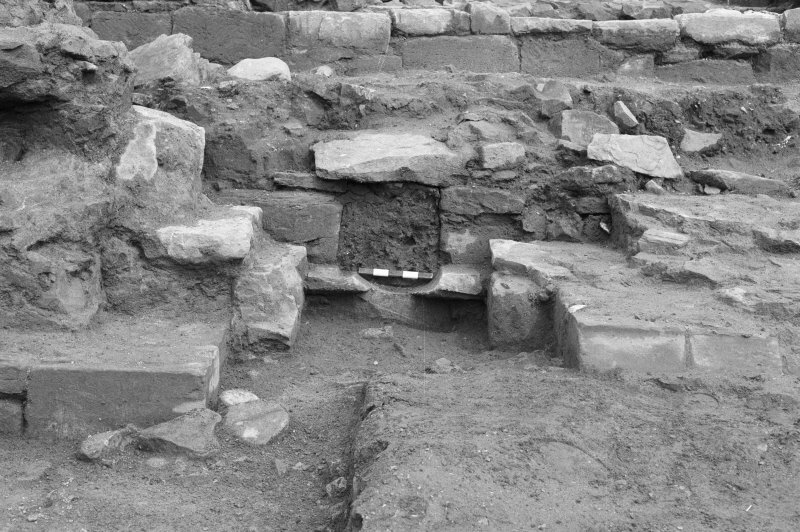 From W.
Jedburgh Abbey excavation archive Frame 16: Area 2: Trench C: Record after first clean. 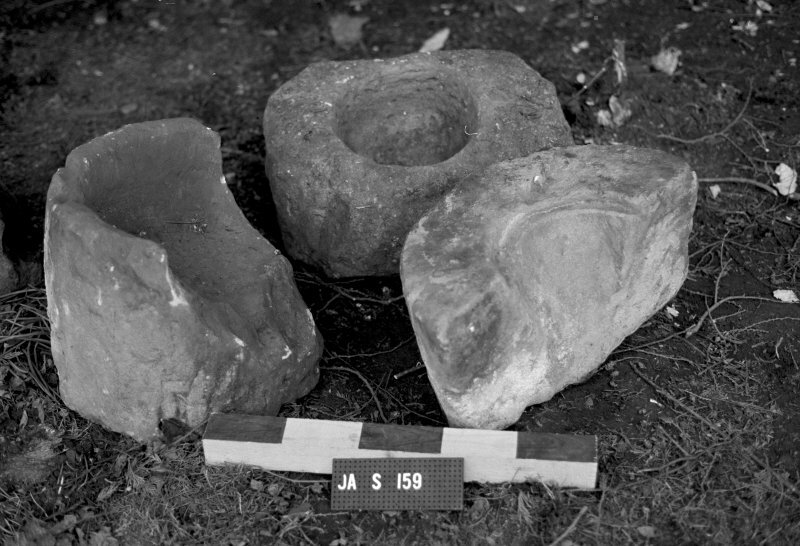 From E.
Jedburgh Abbey excavation archive Frame 33: Area 2: Trench A: Revettment 303, walls 306 and 308. 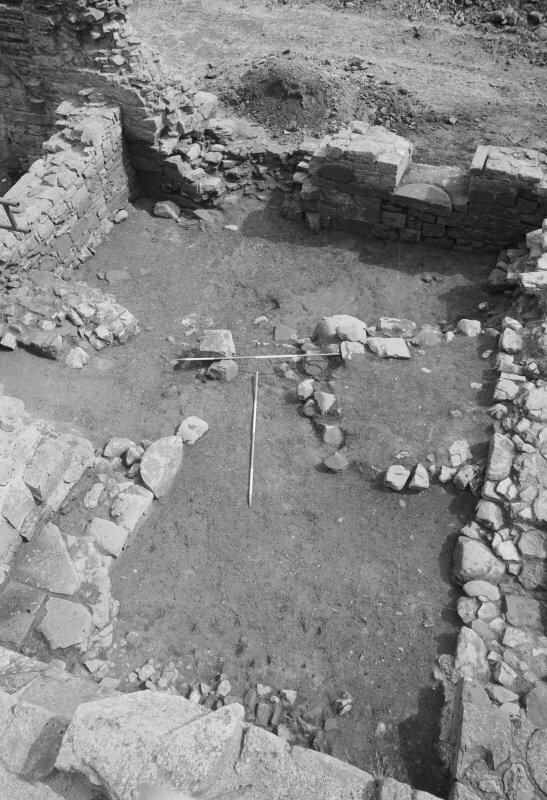 From W.
Jedburgh Abbey excavation archive Frame 10: Area 1: unidentified - Room 11? 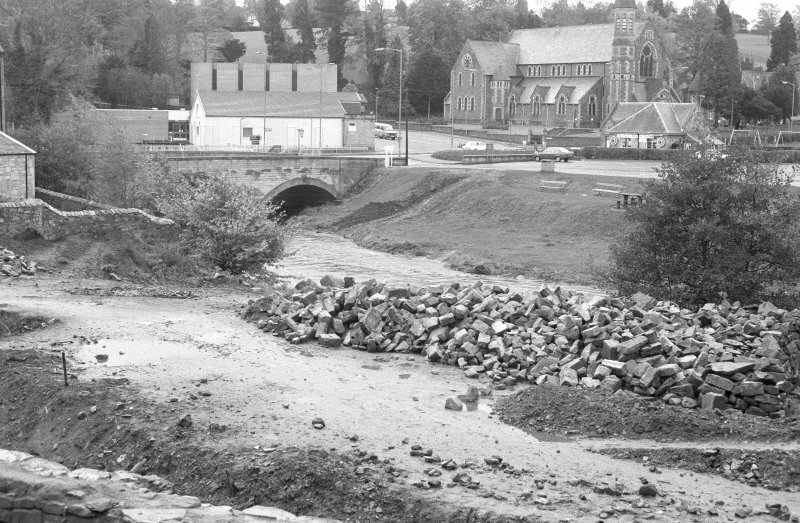 Jedburgh Abbey excavation archive Frame 17: Area 1: E range and Trench J in September 1984. 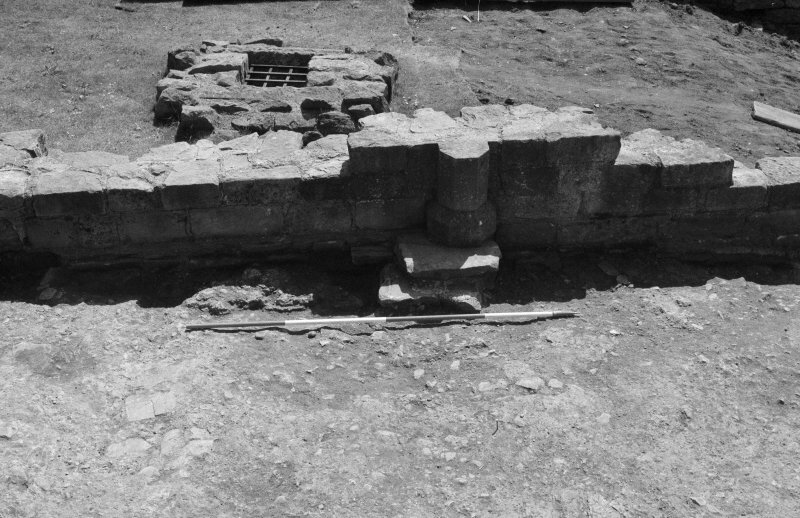 From N.
Jedburgh Abbey excavation archive 1985 Frame 14: Ashlar masonry belonging to the abbey's reredorter lying below the W wall of No.4 Abbey Bridge End. 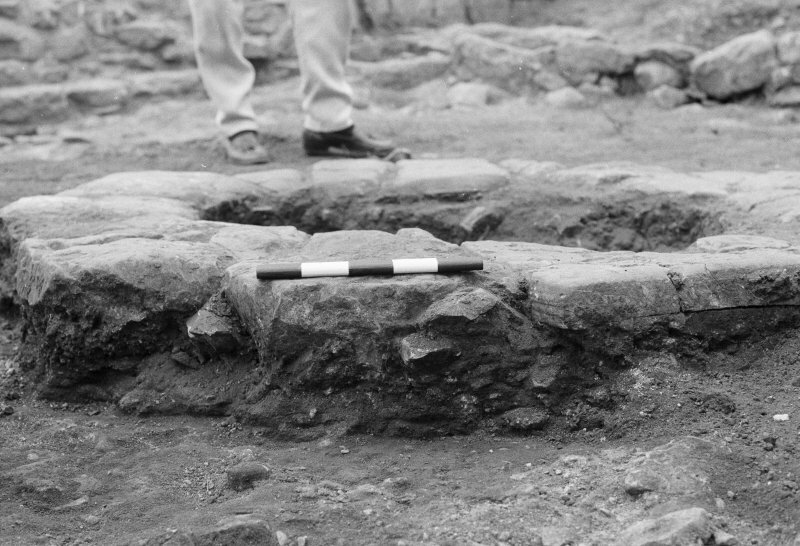 From W.
Jedburgh Abbey excavation archive Frame 6: Area 3: Trench R fully excavated. 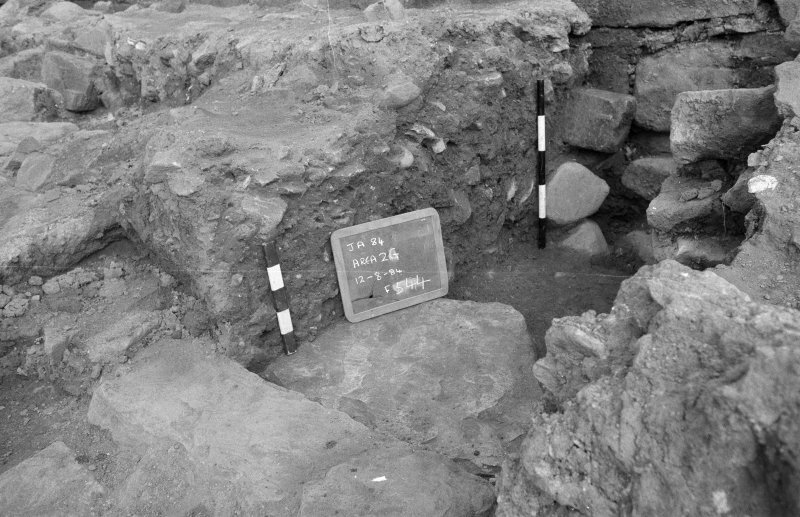 From S.
Jedburgh Abbey excavation archive Frame 37: Area 2: Trench F: Drain 627. 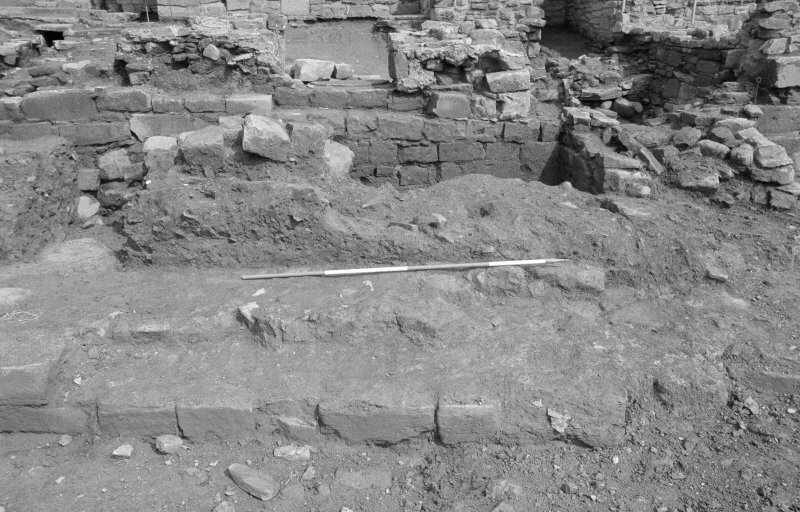 From N.
Jedburgh Abbey excavation archive Frame 35: Area 2: General shots. 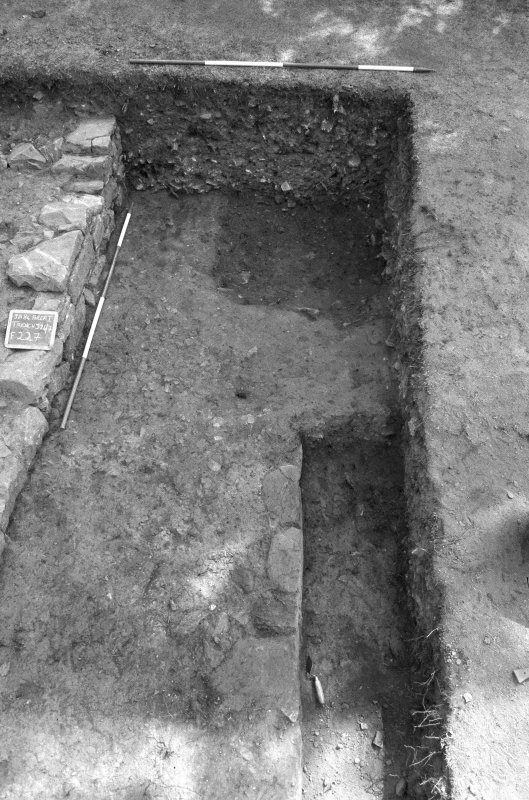 Jedburgh Abbey excavation archive Frame 7: Area 3: Trench R: 1295 fully excavated. 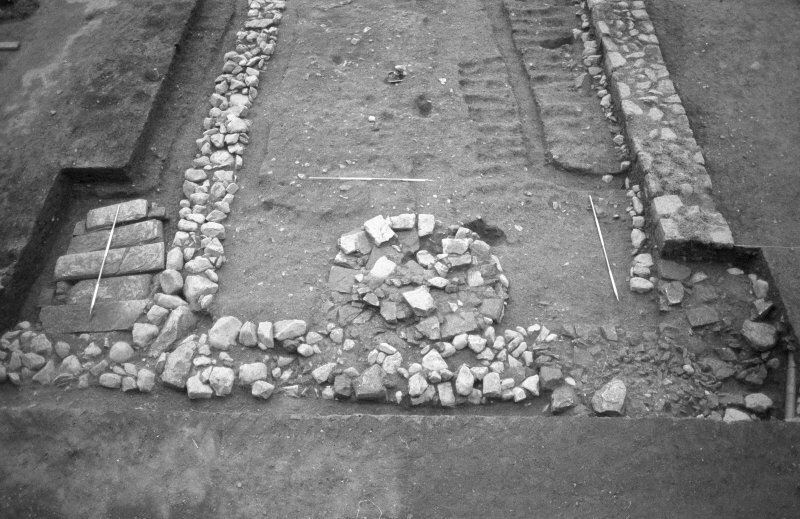 From N.
Jedburgh Abbey excavation archive Frame 26: Area 3: Trench R: Record shot of eastern extension. 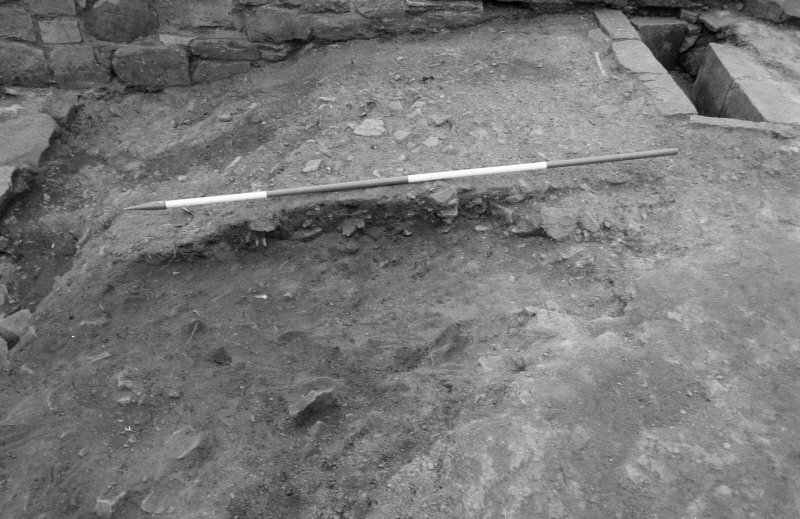 Jedburgh Abbey excavation archive Frame 16: Area 3: Trench V completed. 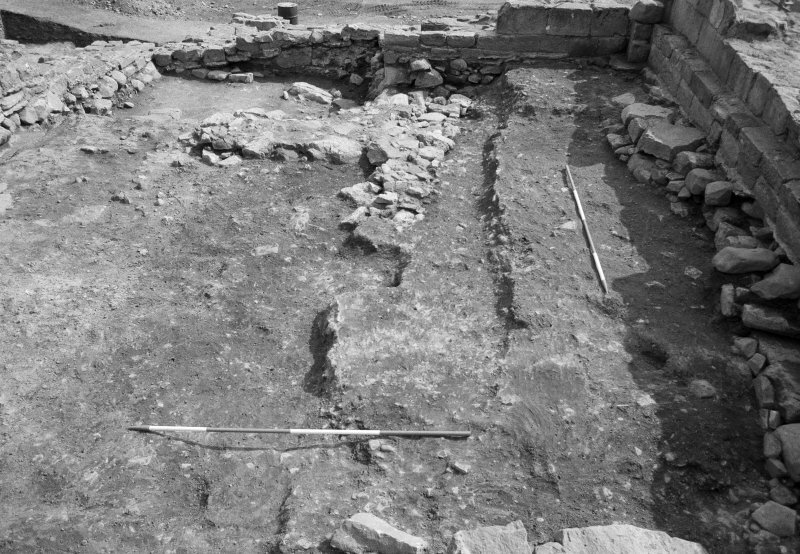 From W.
Jedburgh Abbey excavation archive Frame 9: Area 3: Trench S and T: General view. 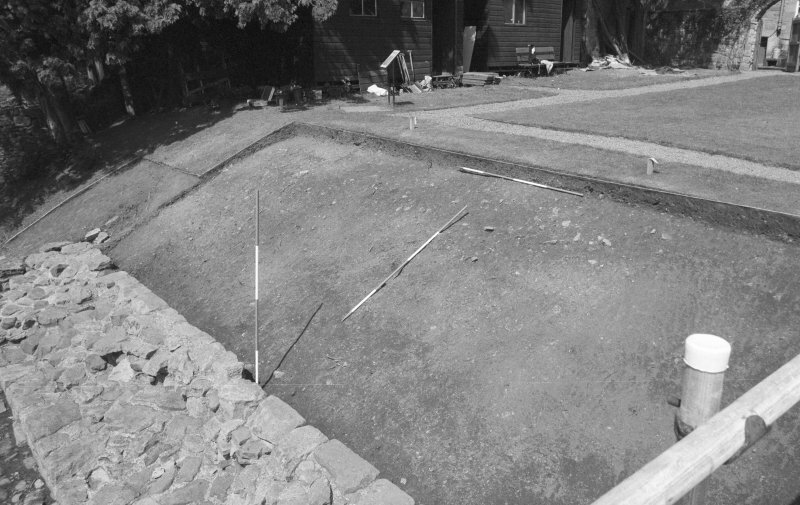 From N.
Jedburgh Abbey excavation archive Frames 28: Area 2: Trench F: W end of wall: sleeper 636 butting against stone footings 636. 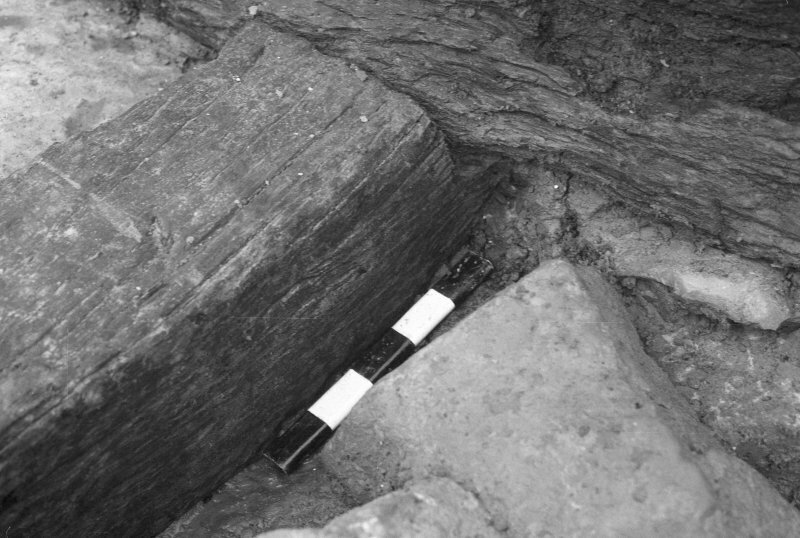 From S.
Jedburgh Abbey excavation archive Frame 5: Area 2: Trench F: S wall, N-S timber 650 emerging from decayed sleeper 644, on stones 638. From SE. 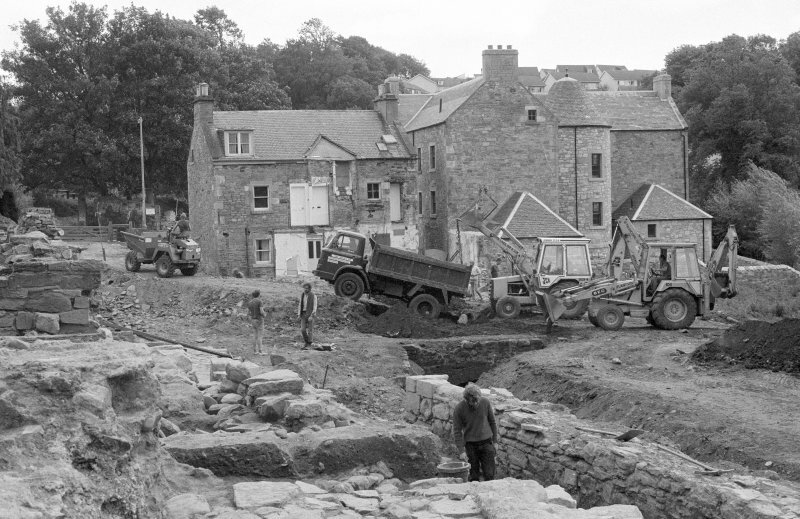 Jedburgh Abbey excavation archive. 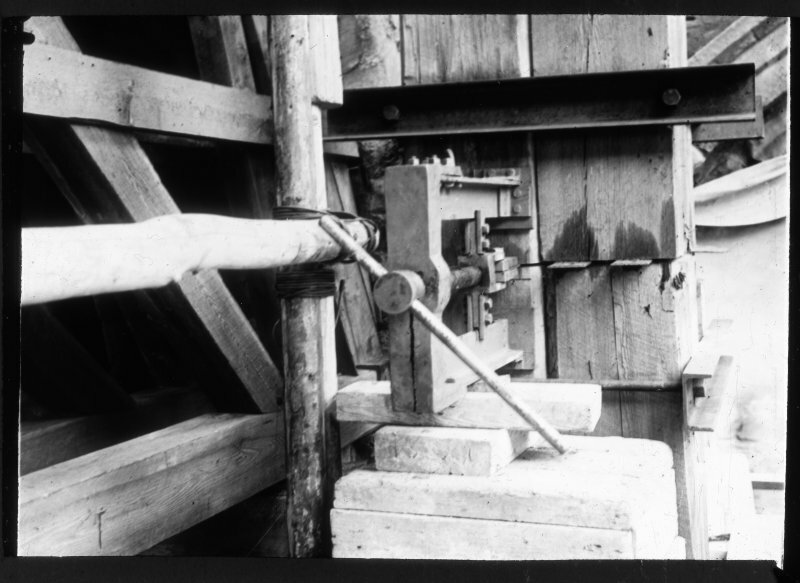 Frame 14: Area 2: Trench F: N-S timber 648 jointed into sleeper 644. From SE. 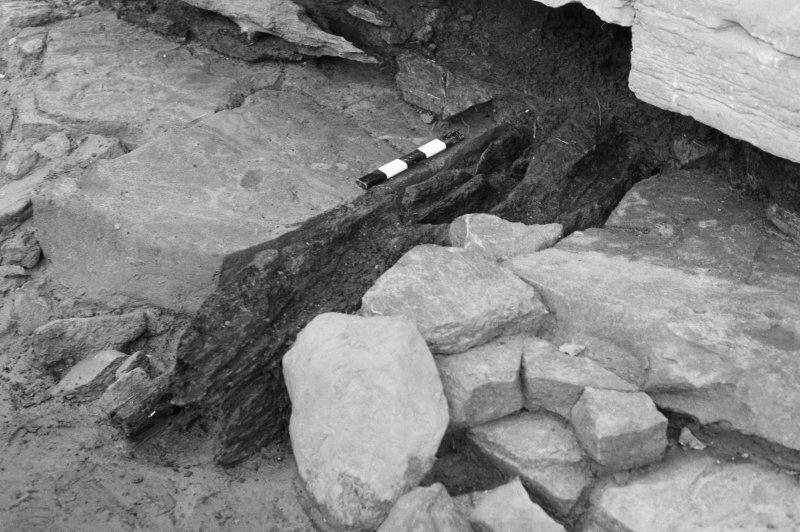 Jedburgh Abbey excavation archive Frame 34: Area 2: Trench F: N-S timber 649 emerging from sleeper 644, sitting on stones 638. 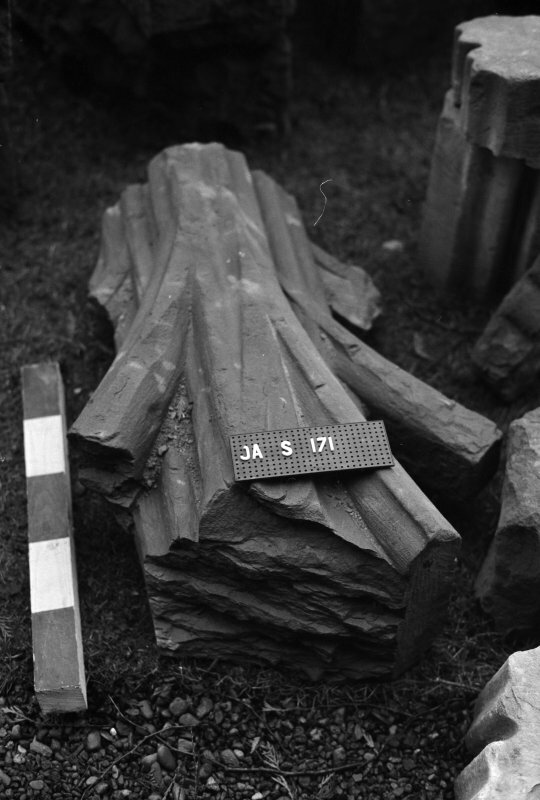 From SW.
Jedburgh Abbey excavation archive Frame 19: Area 2: Trench F: N-S timber 643, also showing junction of 641 and 644. 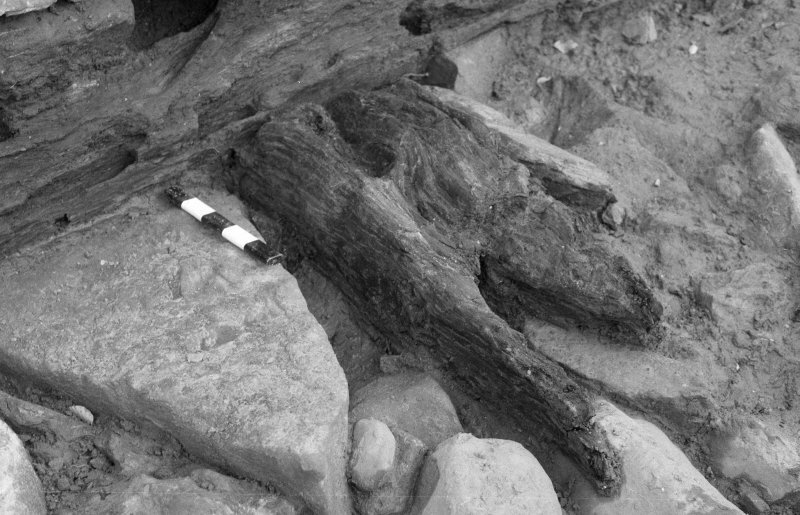 From SW.
Jedburgh Abbey excavation archive Frame 32: Area 2: Trench F: N-S timber 642, emerging from sleeper 641. 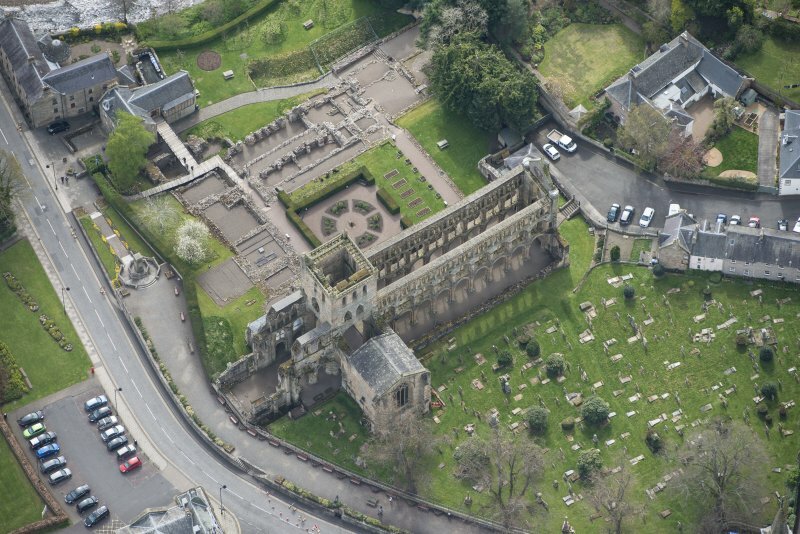 From SW.
Jedburgh Abbey excavation archive Frame 36: Area 2: General view, whole area and church. 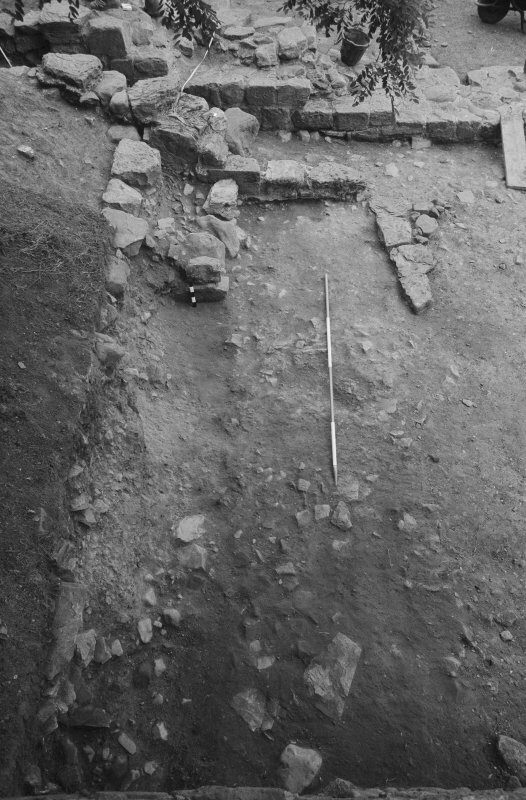 From SW.
Jedburgh Abbey excavation archive Frame 12: Area 3: Trench Q: N end of trench. Column base 1215. 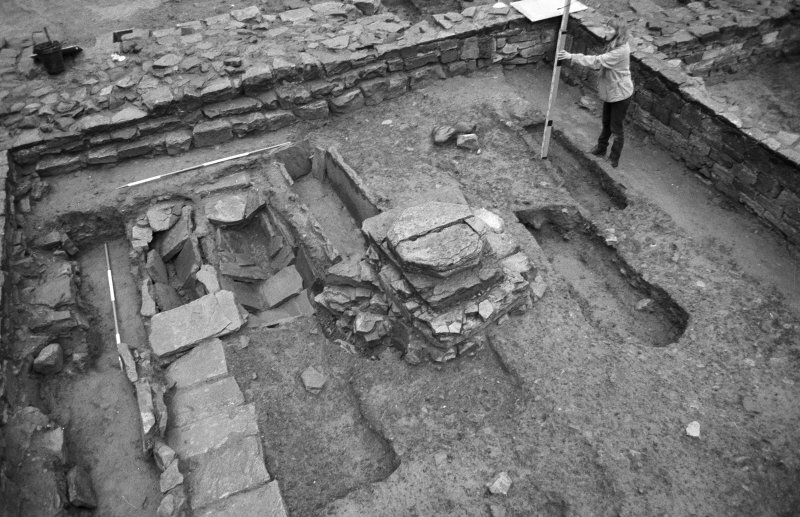 From N.
Jedburgh Abbey excavation archive Frame 18: Area 2: Trenches F and G. General view. 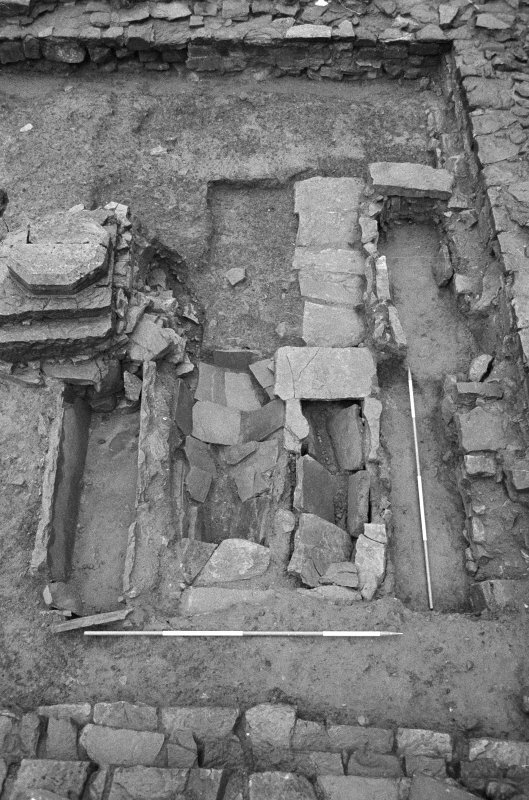 From W.
Jedburgh Abbey excavation archive Frame 13: Area 2: Trenches F and G. General view. 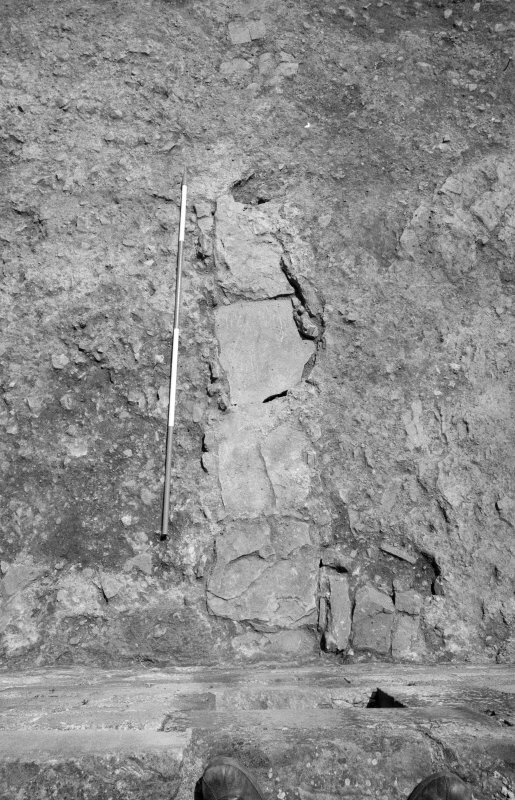 From W.
Jedburgh Abbey excavation archive Frame 31: Area 2: Trench F: Drain 594 and mortary surface 606. 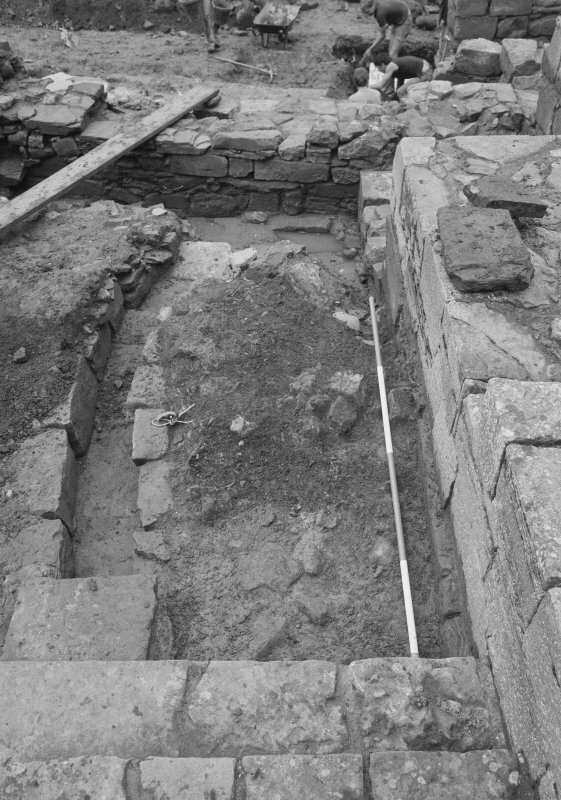 From E.
Jedburgh Abbey excavation archive Frame 25: Area 2: Trench E: Drain 600 partially emptied. 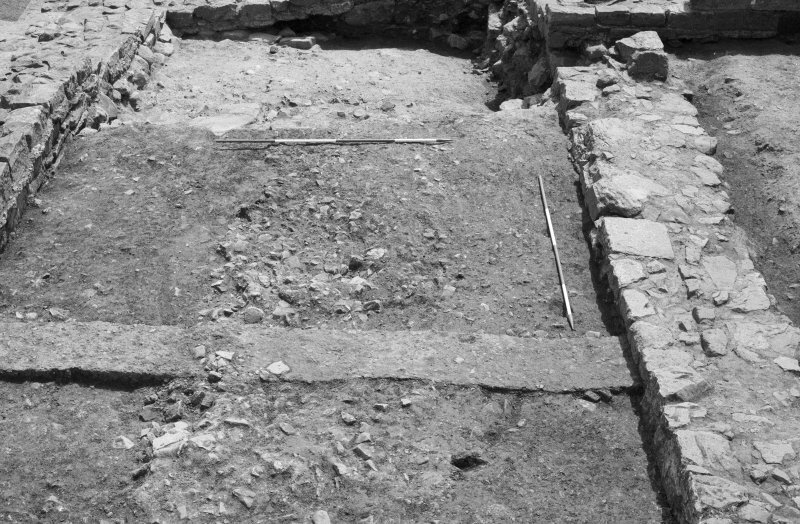 From W.
Jedburgh Abbey excavation archive Frame 5: Area 1: Room 3: Graves 826 and 822 with capstones. 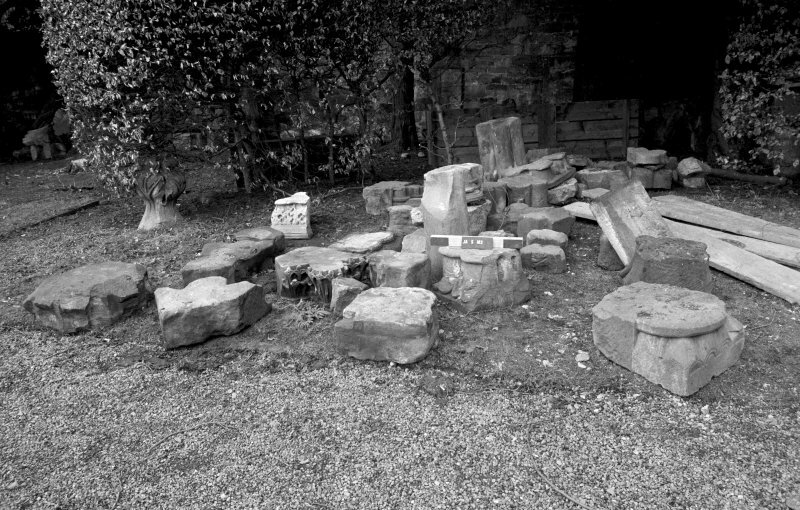 From W.
Jedburgh Abbey excavation archive Frame 16: Area 1: Room 3: Graves 826, 822 and 872 with capstones and emptied graves 829, 290 and 285. 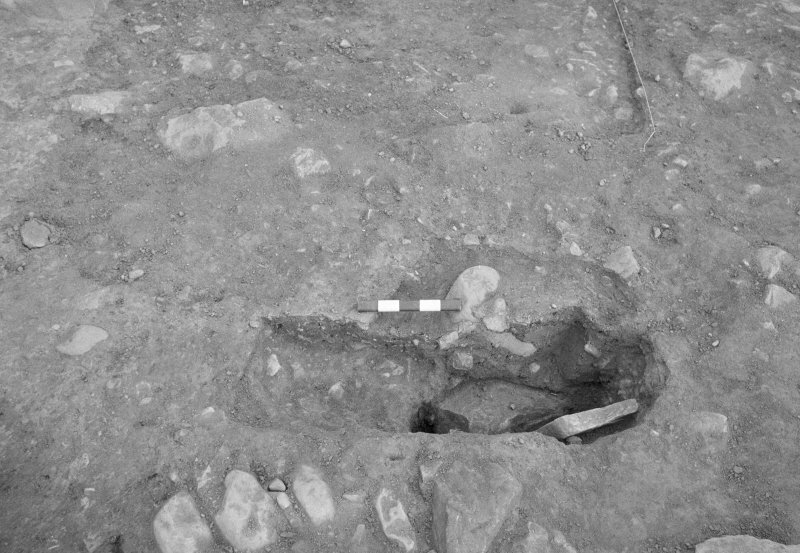 From E.
Jedburgh Abbey excavation archive Frame 21: Area 1: Room 3, showing coffin burials 282 and 289 cut into robber trench 888. From NW. 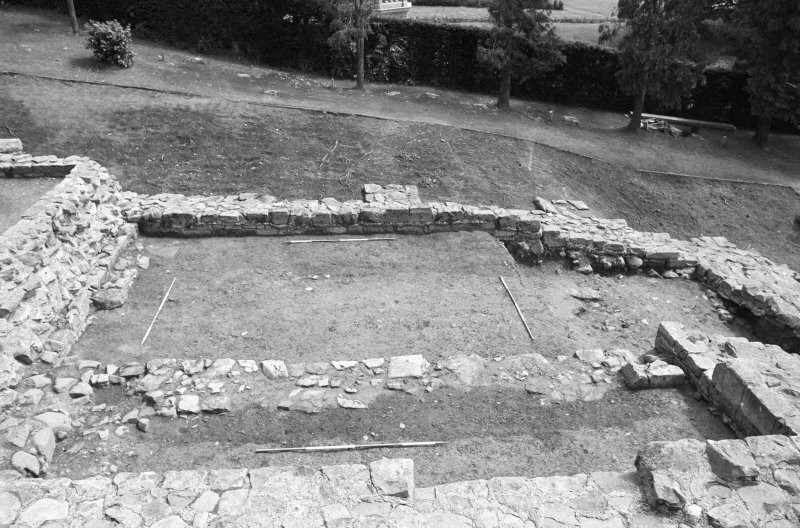 Jedburgh Abbey excavation archive Frame 16: Area 1: Room 1, showing rebuilt wall 107 and old ground surface 196 to its E. From N.
Jedburgh Abbey excavation archive Frame 26: Area 1: Room 4 after removal of wall 149, showing 207, 847 and 215/848. 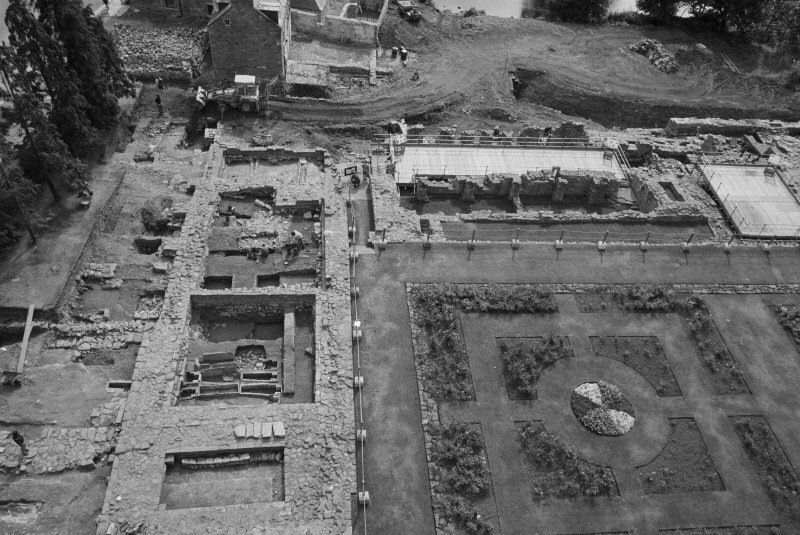 From N.
Jedburgh Abbey excavation archive Frame 24: Area 1: Trench J: Walls 246 and 253 and robber trench 240. 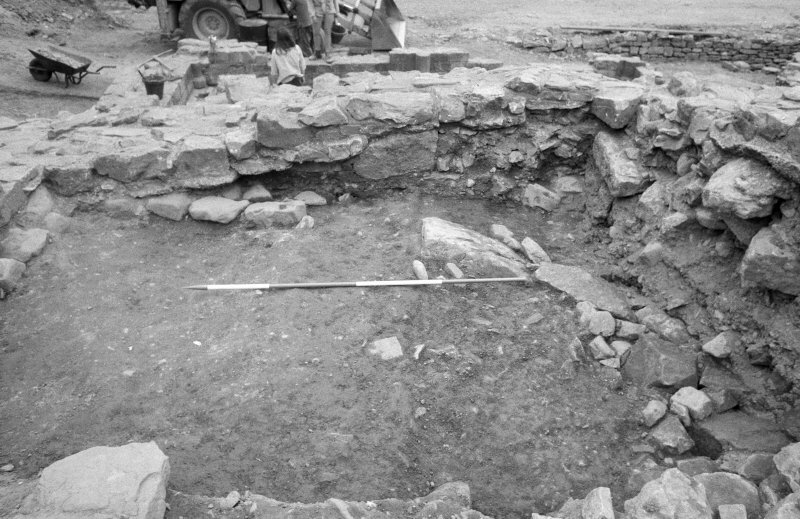 From W.
Jedburgh Abbey excavation archive Frame 2: Area 1: Trench J after removal of 275, showing circular pit 292 cutting 274. 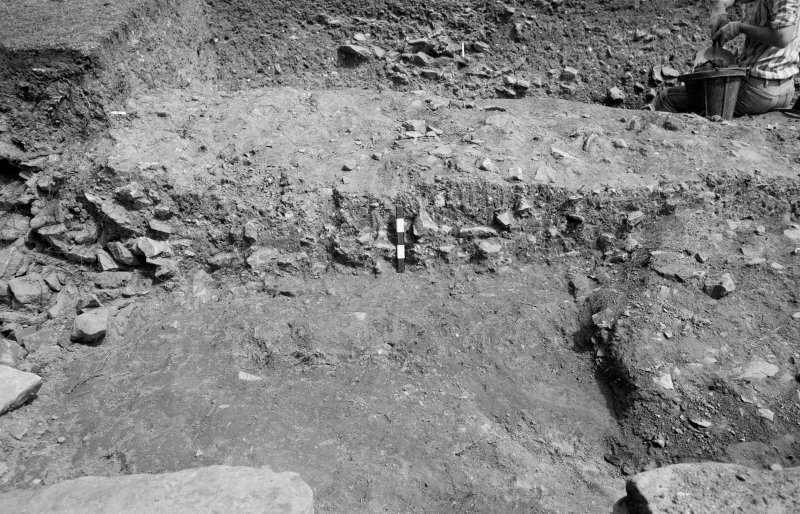 From W.
Jedburgh Abbey excavation archive Frame 21: Area 1: Room 4, showing post-Reformation levelling deposits 187, 188 and 190. 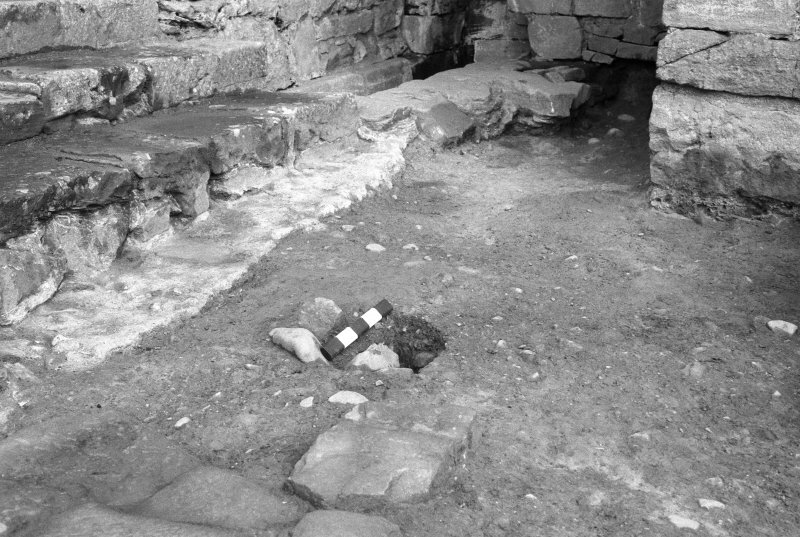 From N.
Jedburgh Abbey excavation archive Frame 9: Area 1: Room 5: Drain 160 partially covered by mortar 165. 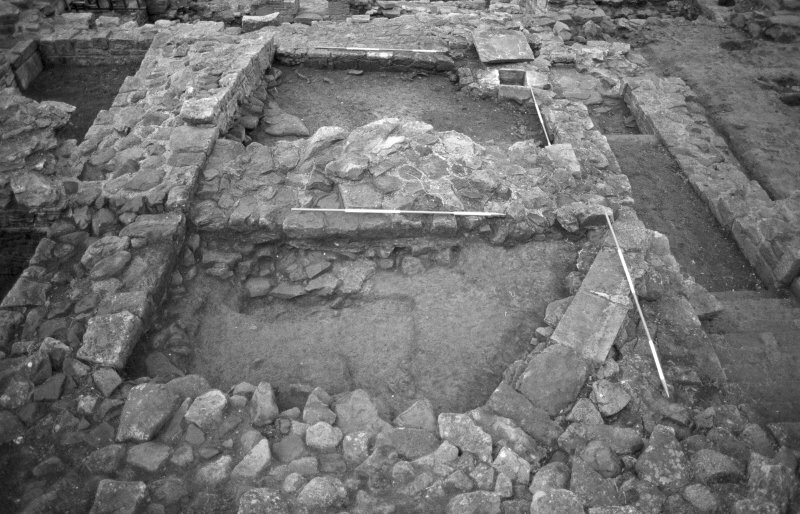 From N.
Jedburgh Abbey excavation archive Frame 8: Area 1: South end of Room 5 after removal of topsoil from against its S wall. 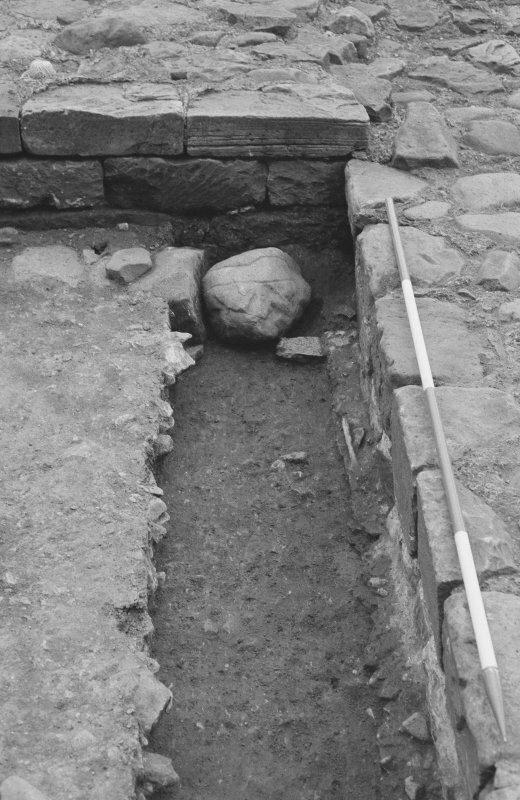 From N.
Jedburgh Abbey excavation archive Frame 14: Area 1: Room 5: Drain 160 with capstones. 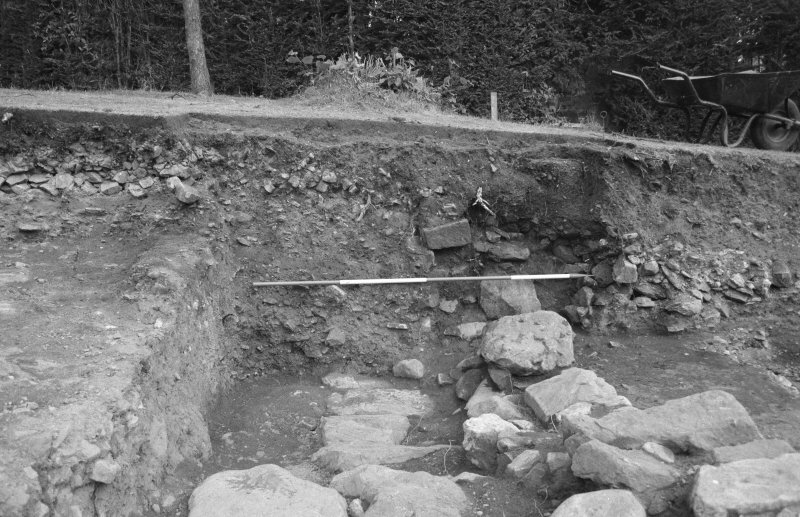 From N.
Jedburgh Abbey excavation archive Frame 31: Area 1: North end of Trench J. 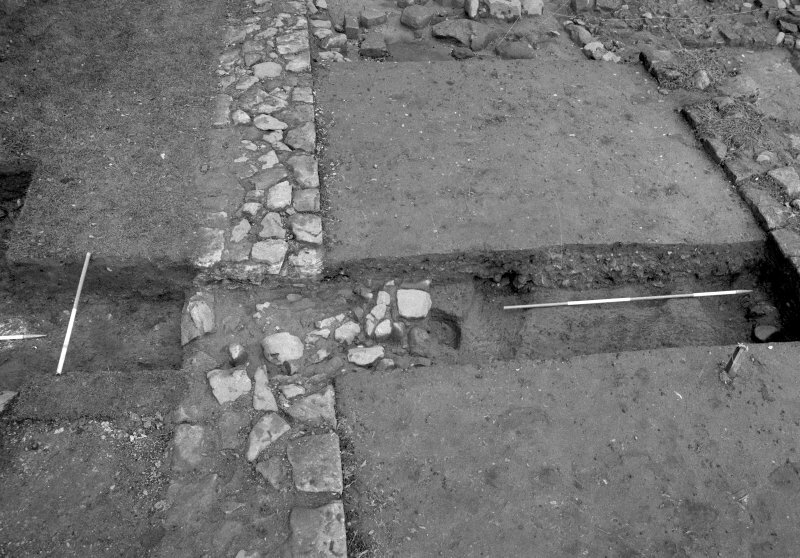 From S.
Jedburgh Abbey excavation archive Frame 5: Area 1: Trench J: Hearth 204 and section across post-Reformation floor 205. 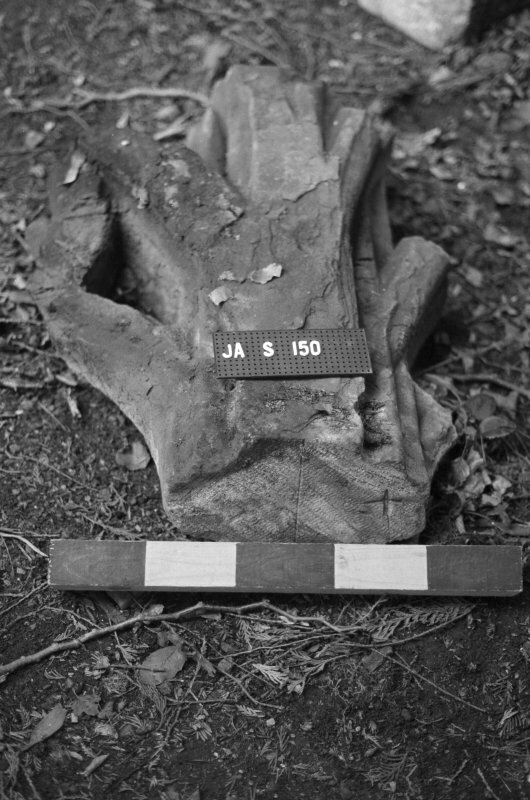 From S.
Jedburgh Abbey excavation archive Frame 3: Area 1: Trench J: Grave 233 cutting 260. 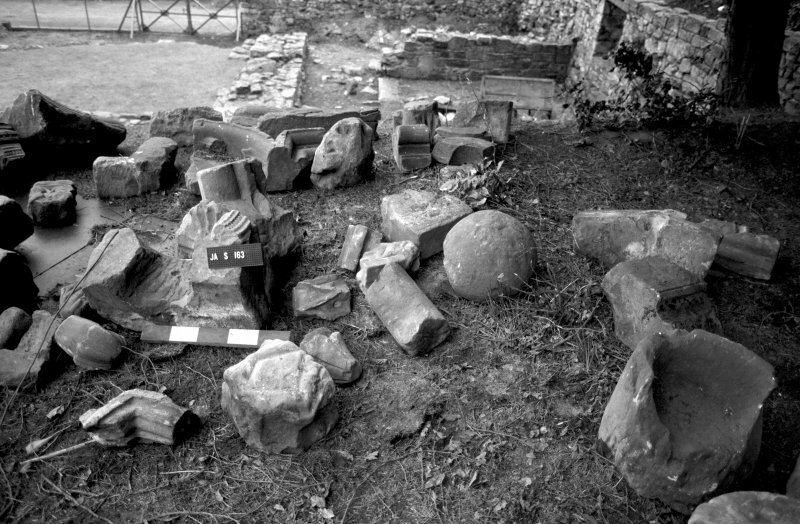 From W.
Jedburgh Abbey excavation archive Area 1: Room 3 after removal of 1930s' backfill, showing probable post-Reformation graves, aligned N-S. From N.
Jedburgh Abbey excavation archive Area 1: Section across modern deposits in Room 1 (South Transept). 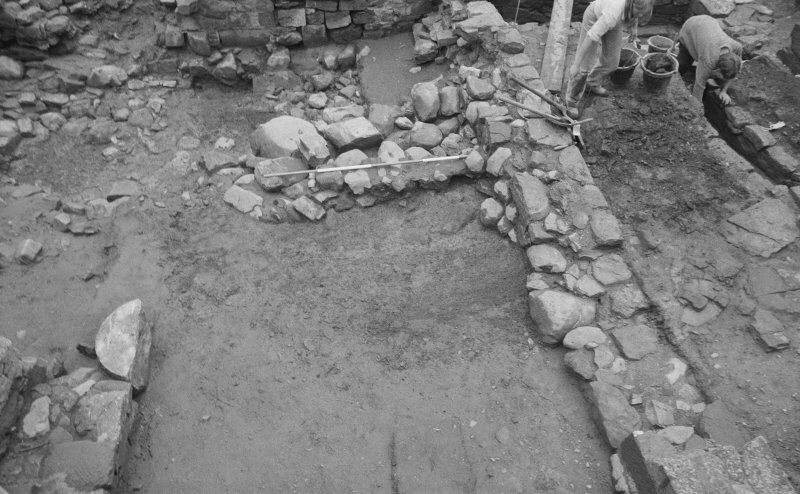 From W.
Jedburgh Abbey excavation archive Area 1: West wall of post-Reformation building within Room 4, showing 1930s' robber trench. 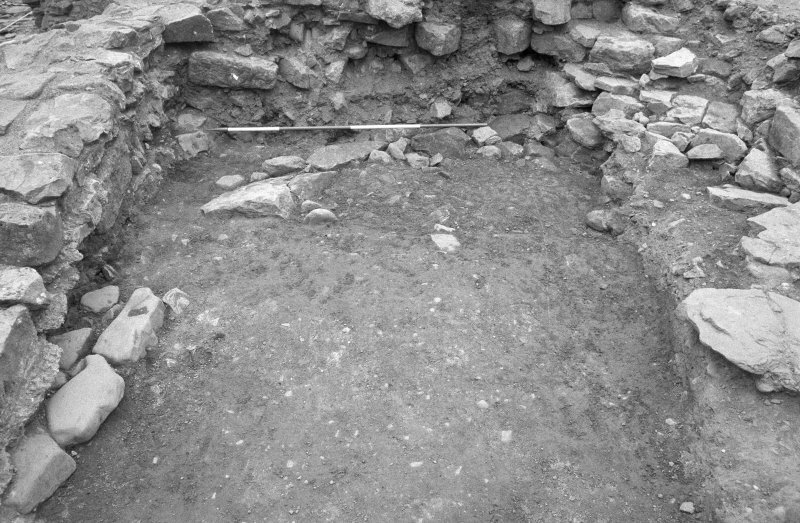 From N.
Jedburgh Abbey excavation archive Area 1: Room 4. 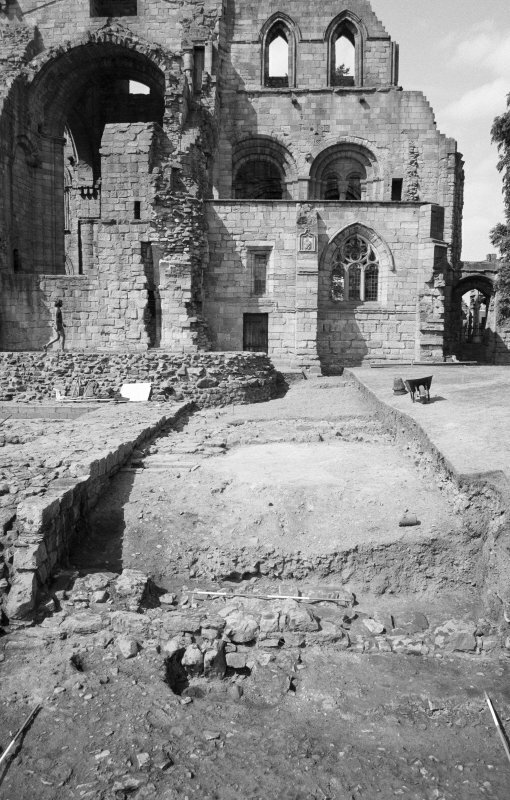 From W.
Jedburgh Abbey excavation archive Area 1: Room 3 (Chapter House) early in excavation, showing 1930s' excavation trenches. From W.
The site of the Augustinian Abbey of St. Mary has been occupied by a church from the 9th century onwards; but this early church only appears in history at the turn of the 11th and 12th centuries. This church seems to have been adopted by the Augustinians until their Abbey church was sufficiently advanced for use; no part of it has survivied, but the plan of the abbey cloister suggests that it stood in the position occupied by the six eastern bays of the present nave. 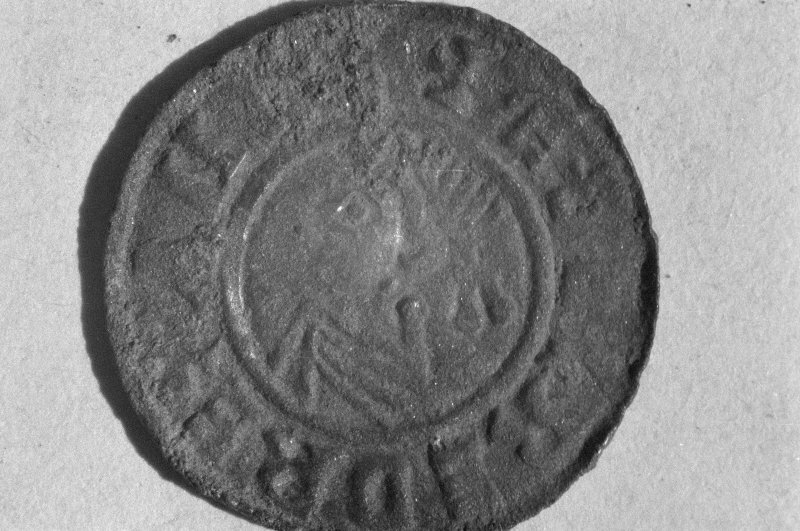 The house was founded by David I before 1139. The choir may be ascribed to the second quarter of the 12th century. The early church was probably demolished before 1174, and the church, as a whole, was evidently finished by the middle of the 13th century at the latest. That done, the cloister was remodelled. The abbey was rendered uninhabitable by the English in 1297, and was thrice ravaged again in the 15th century. 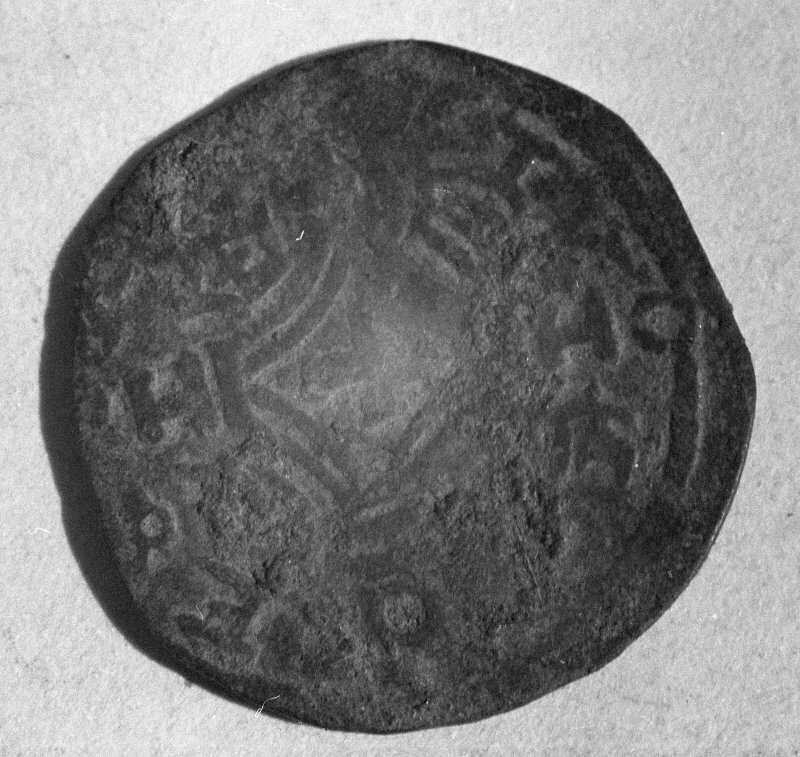 Reconstruction took place in the 14th and 15th centuries. The tower was partly rebuilt between 1504 and 1508, but in 1523 the abbey was burnt by the English, and again in 1555. However, the church was sufficiently entire to be used in 1552 for the consecration of Bishop David Painter. Seven years later the abbey was suppressed. By 1220 an altar in the nave had been appropiated to parochial use, and a parish church is mentioned in the 16th century. In 1668-71 a new church was erected within the west end of the nave. In 1875 the parish church was removed to a new site, and the abbey church thereupon ceased to be a place of worship. At this time the ruin of the abbey was repaired and the post-Reformation additions removed. In 1913 the fabric was placed in the guardianship of the Ministry of Works and has since then been thoroughly consolidated. 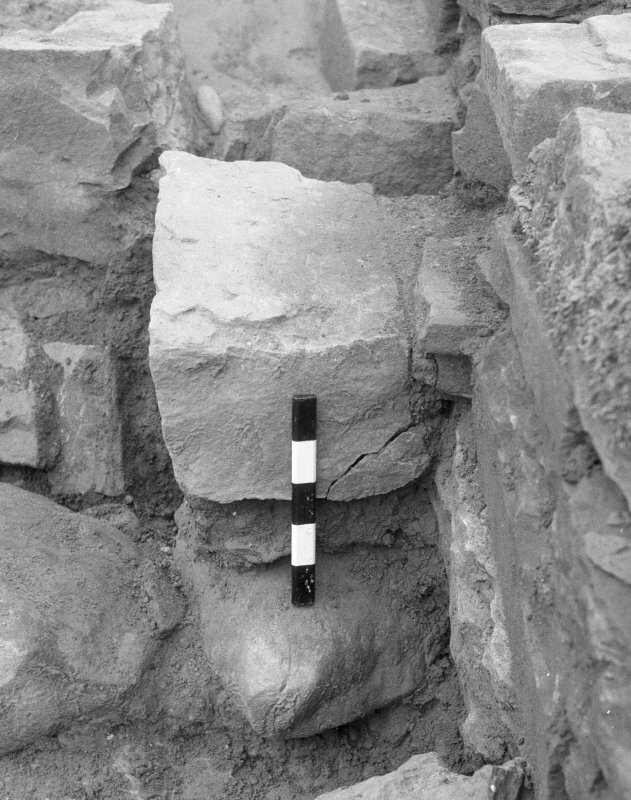 Immediately inside the entrance to the stair in the northern external buttress at the west portal of the Abbey Church, a Roman Altar has been re-used as a lintel. 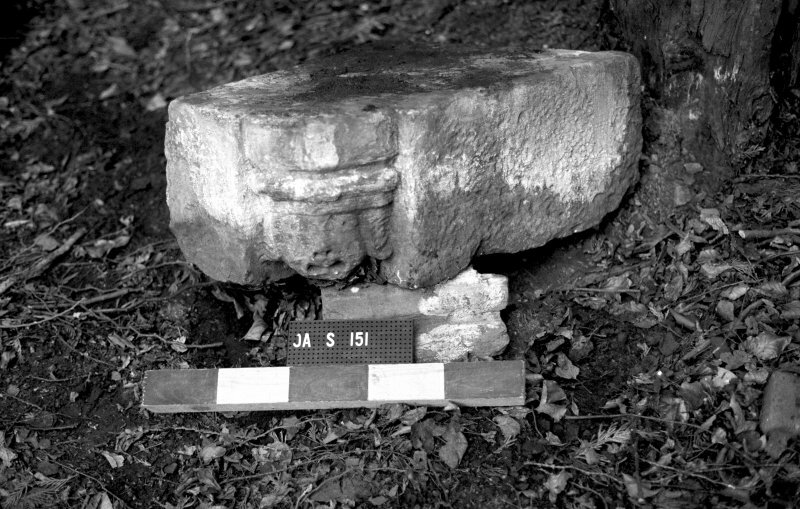 This altar may have come either from the fort at Cappuck (Roxb 20 NW 12) or, more probably, from some nearer site as yet unidentified. 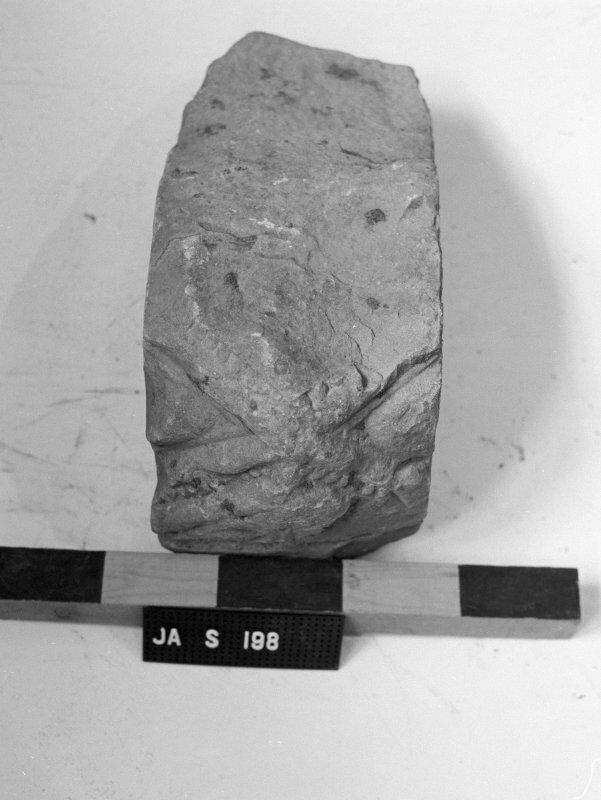 In the south face of the south wall of the undercroft of the frater, there is set a fragment of Roman carved stone, 15 1/2 inches high x 13 1/2 inches wide. 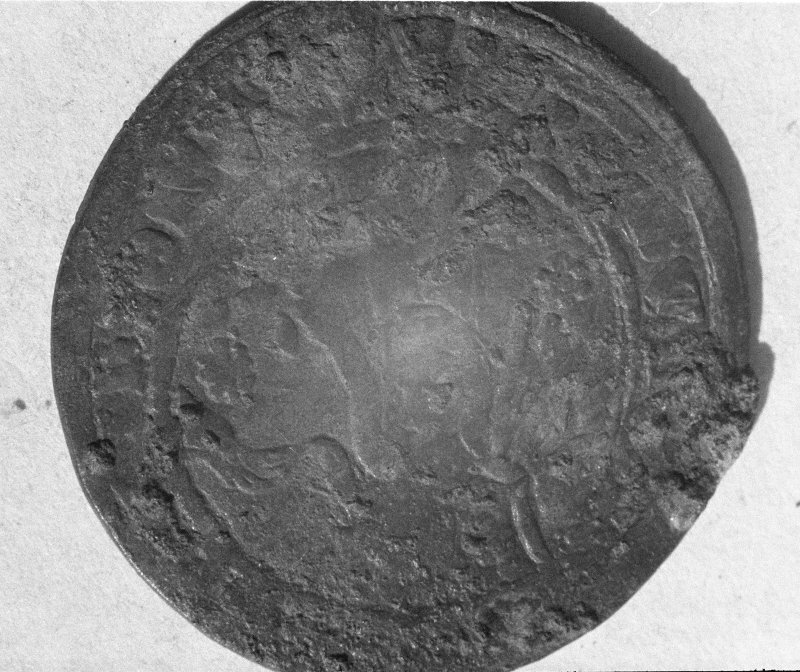 The piece seems to have been broken off from the left-hand top corner of the back of a large altar. Part of the inscribed face of a Roman Altar, re-used in paving the NE angle of the presbytery after having been cut down to its present dimensions of 19 x 17 x 6 inches, now lies in the parish graveyard, adjoining the abbey on the north. 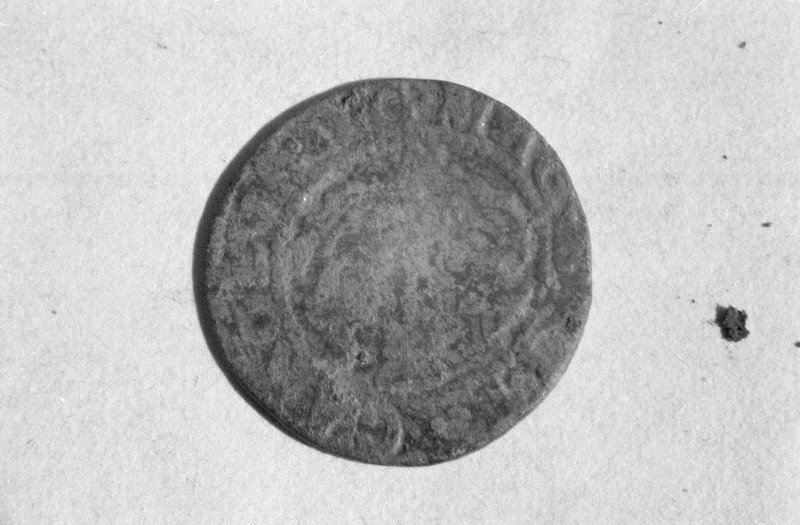 Also in the parish graveyard there are three fragments of stone which, according to Mr C A R Radford who dates these fragments to about AD 700, doubtless came from the shrine of a saint - possibly St. Boisil, one of the early abbots of Old Melrose (Roxburgh 8 NE 7 ). Also in the graveyard are fragments of more than one Dark Ages cross, and a small fragment of a cup and ring marked stone found within the Abbey in 1903. Mason's marks from Scottish churches, abbeys and castles recorded between 1857 and 1861 on 29 drawings in the Society of Antiquaries of Scotland Collection. 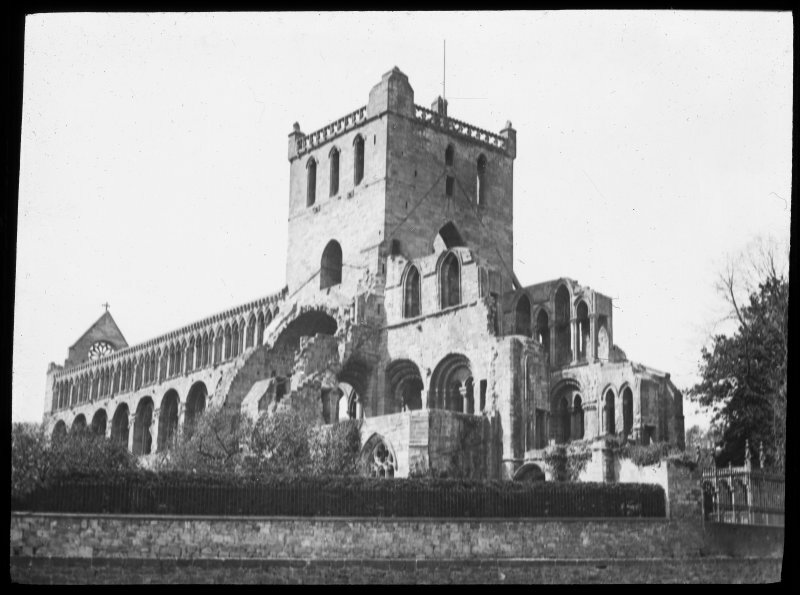 The Abbey and its associated buildings are as described and illustrated by RCAHMS 1956. The fragment of Roman carved stone in the undercroft of the frater, and the fragments of Dark Age crosses in the graveyard were not located. 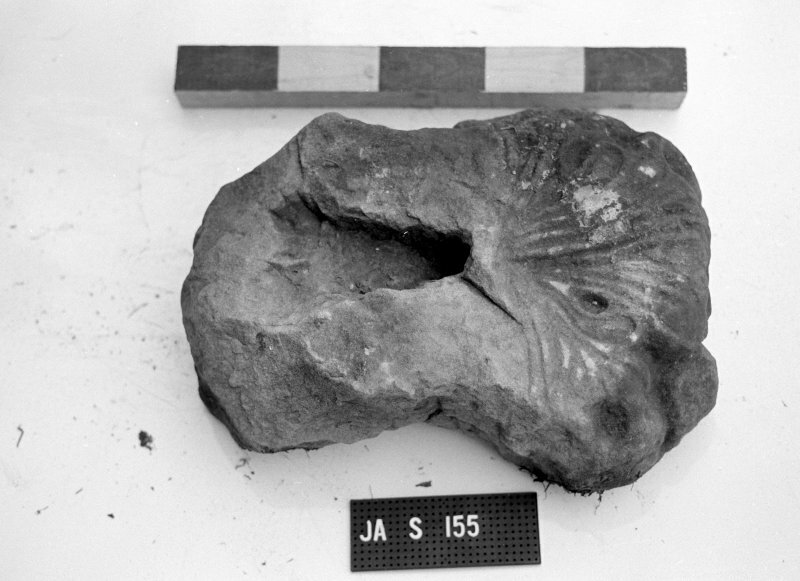 The carved stone may lie with one of the many stone fragments on the floor of the small museum attached to the abbey. Visited by OS(EGC) 7 January 1963. 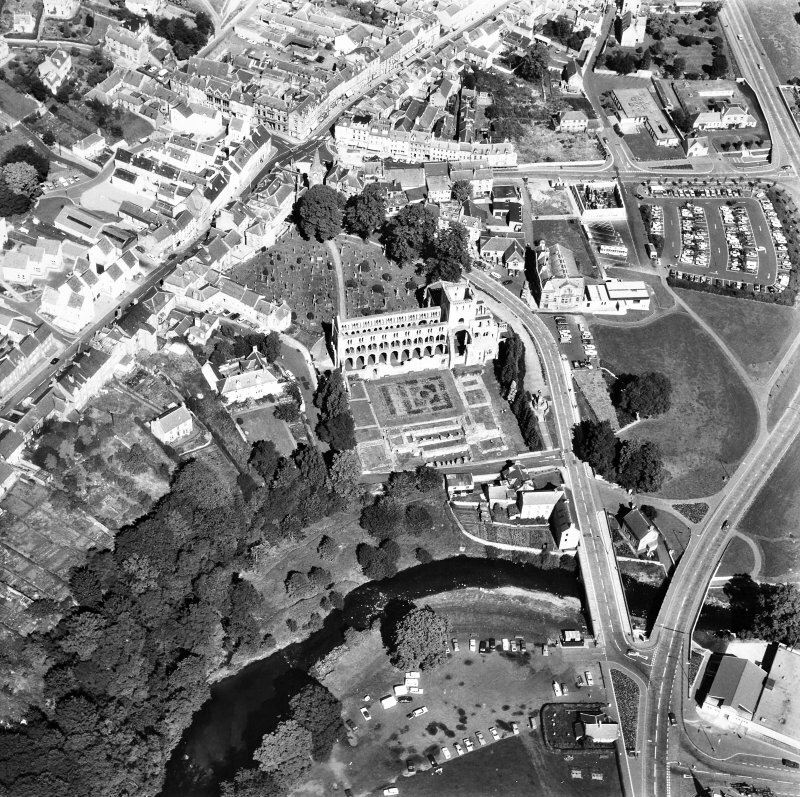 Oblique aerial photographs of Jedburgh Abbey and Jedburgh Castle Jail taken by John Dewar in 1968. Jedburgh Abbey Centred NT 6503 2044. 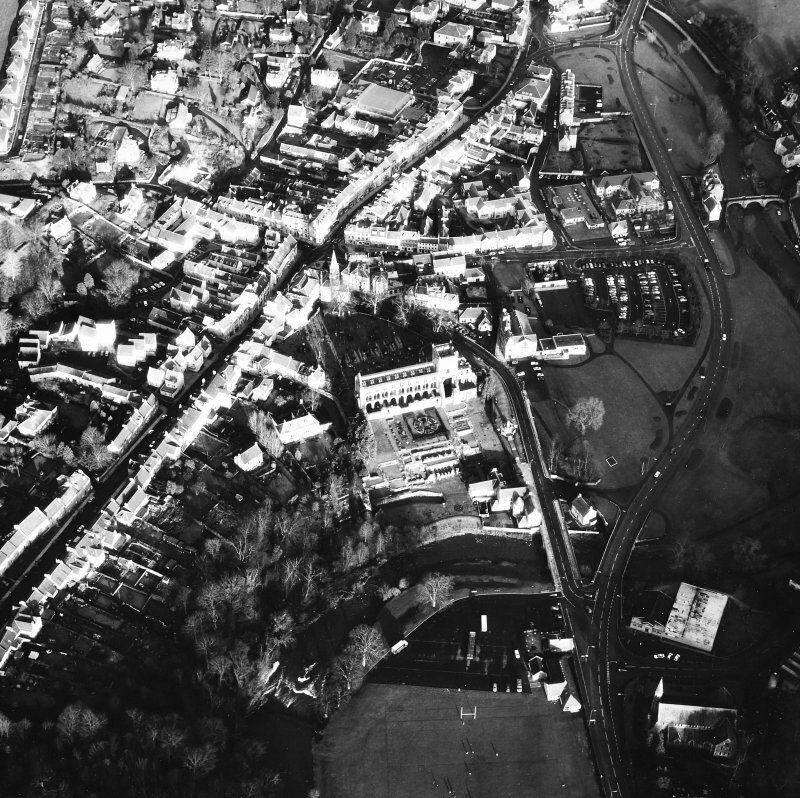 Several trial trenches were opened to the S of the Abbey precinct to help locate some of the monastic buildings that were to be fully uncovered in 1984. 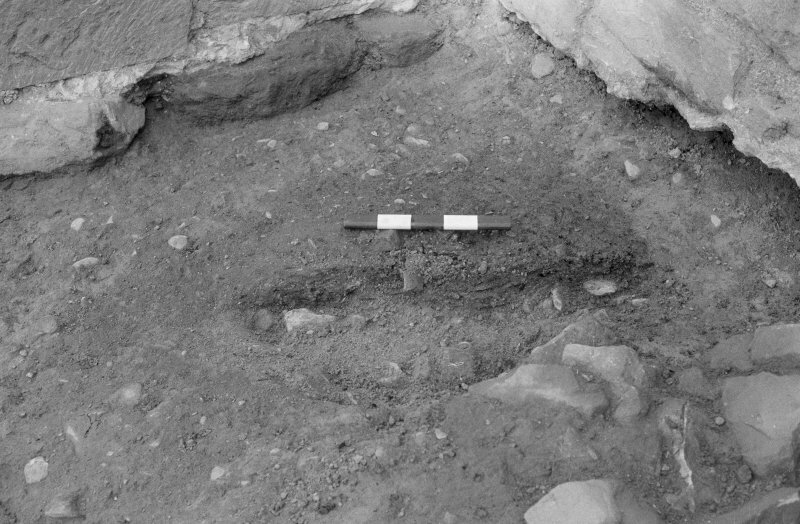 Part of an arch, including some finely tooled masonry, was found below the road (The Bow) to the S of the E range. Its position (formerly adjacent to the Jed Water) suggests it may have been part of the reredorter. 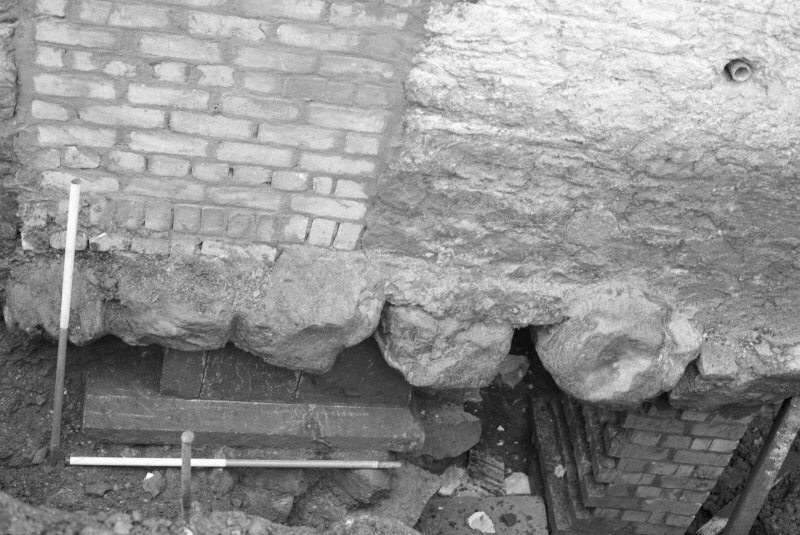 At the junction of Abbey Close and The Bow a wall of about 3m height was exposed. Between the road and the Jed Water the construction of a lade that supplied the nearby 19th century silk works may have damaged some of the medieval structures that existed in that area. 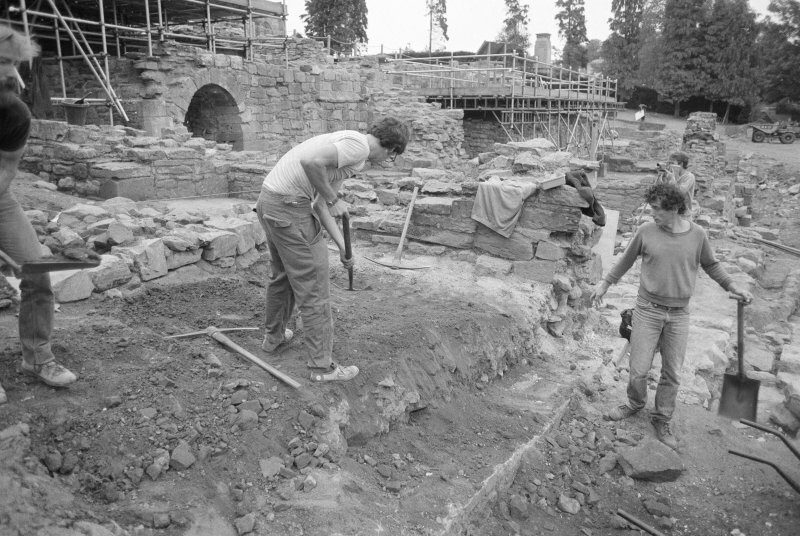 Following the partial excavation of 1936-37 and the trial trenching of 1983, during the summer of 1984 most of the abbey's claustral area was excavated, including: the cloister garth; East Range; West Range; frater; and extensive trenches beyond those ranges. 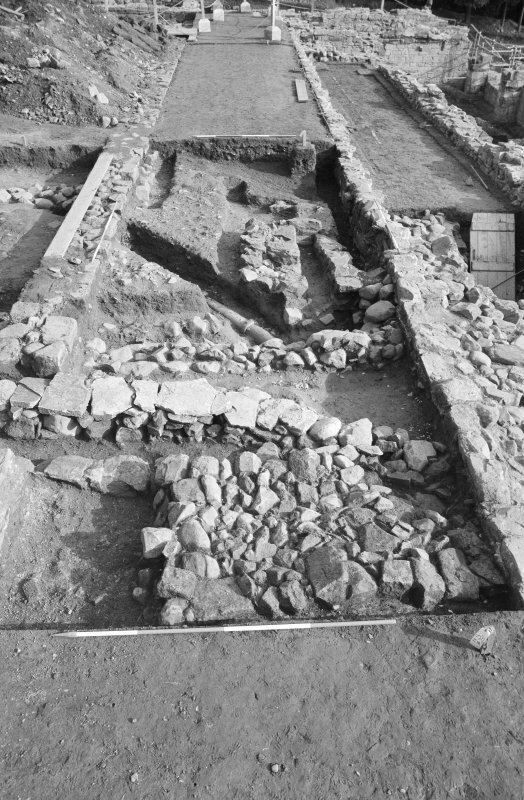 The East Range at the excavated level comprised: slype/parlour; chapter house of at least three phases with associated floor levels and burials; two apartments of unknown functions (although one may have included the foundations of the day stair); a quadripartite-vaulted undercroft of two bays EW and at least two bays NS, the northern two bays divided by a secondary partition wall; and possibly the reredorter beneath an extant 19th century house. The house straddled a stone-lined 19th century lade whose course may have echoed that of the monastic great drain. 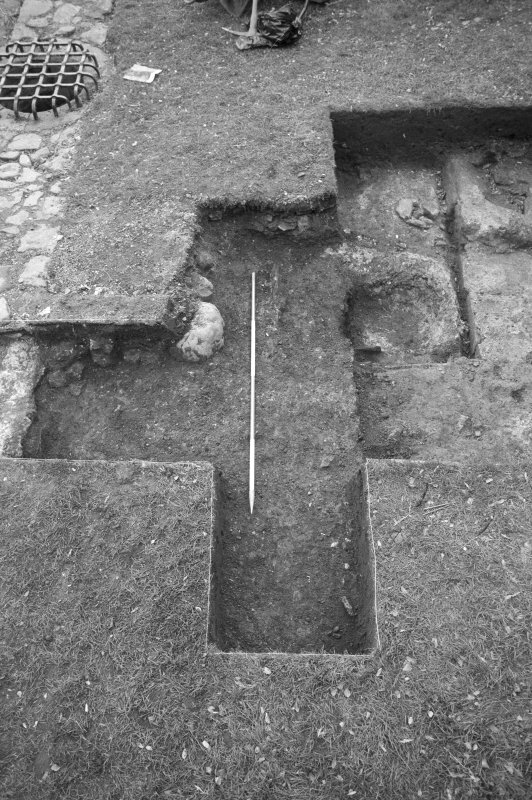 Beyond the East Range were: the monastic graveyard; two phases of an exteded chapter house; wall foundations and associated metalled surface thought to be pre-Augustinian, and a ditch cutting through the early metalling. The ditch appartenly acted as a swer at some stage and was backflled in the 12th century presumably to allow the construction of the East Range. Further south, down an alluvial terrace, were the poorly-constructed walls of a building, or buildings, of uncertain date. To the SW and S of the frater were kitchens and other domestic apartments as well as at least two timber buildings of medieval age. S of the frater were the substantial remains of a building descriebed by RCAHMS Roxburgh I (1956, 206) as the undercroft of the infirmary but which may have been the abbot's lodging. Beyond, the ground adjacent to the Jed Water had been made up in medieval times but had been consolidated with only limited success. Several post-monastic dwellings were evident in the vicinity of the East Range and part of the 18th/19th century manse was located to the west of the cloister garth. Little more than the foundations survive of the monastic buildings which stood on the slope between the Abbey and the Jed Water, but the nave and the north transept are complete up to the topmost wallhead, and the tower stands as it was rebuilt in 1504-8. The site had been occupied by a church since the 9th century; then, c1138, Augustinian Canons were brought from near Beauvais in France and by 1174 the choir, crossing and both transepts were sufficiently complete to be used for services. The nave was constructed by 1200 and by 1220 the east end was reconstructed after the removal of the original semicircular apse. The whole church was evidently complete by the mid 13th century when attentions were turned anew to the cloisters. These were remodelled, and by the late 15th century the north transept was extended. It is a powerful place, very much dependent upon its clustered pillars and strong bridging arches. The great stone piers are carried, unusually, to the level of the triforium at first-storey level- a technique that creates an impression of height in an otherwise relatively low interior (of Dryburgh, no. 68). There, the delicate arcading is surmounted by a light and airy learstory.Remarkably intact in spite of constant warring, Jedburgh conveys the feelings of agreat abbey interior more fully than any other of the Border Abbeys. After the reformation a church was 'made' within the crossing of the abbey and transepts; and a 'new' church was provided in the west part of the nave in 1671. In 1743 the crown arch and vault of the crossing collapsed and the dangers of falling masonry doubtless partly explain why the parish church was removed entirely from the abbey in 1875. Within the museum there are a number of important sculptured stones, notably a Roman altar slab, sections of an 8th century AngJian shrine or sarcophagus elaborately decorated with birds, animals and vinescroll (see section 6), several pieces of 8th-9th century early Christian cross-heads and shafts, and a 12th century cross-inscribed tomb-cover-possibly that of John, Bishop of Glasgow who died in 1148 and was buried at Jedburgh. Elsewhere in the town are the fine 16th century bastlehouse (Queen Mary's House) and hump-backed bridge across the Jed Water at the foot of the Canongate. 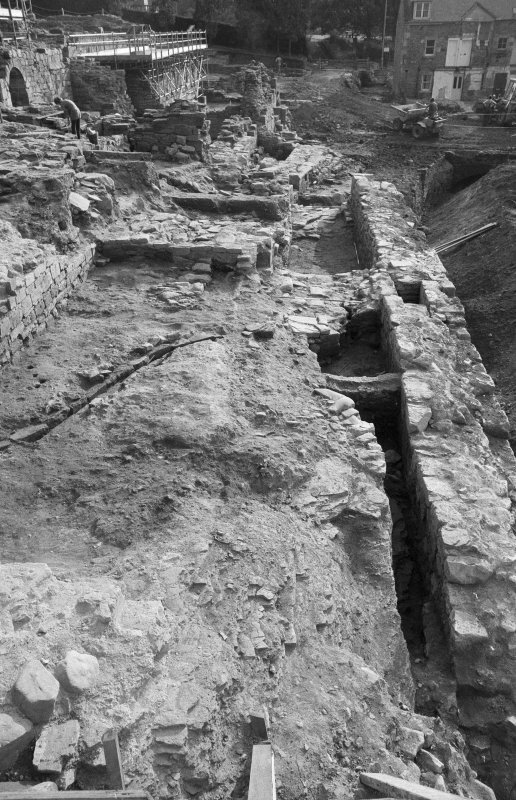 The three elements of the investigation in 1990 comprised: a watching brief duting cable-laying along the length of the nave and within the choir of the abbey church; trenching within the seventh bay of the nave, to establish whether there had been a temporary western gable during the building's early years; and excavation within the presbytery to determine whether the church had been extended eastwards at some stage. The cable trench yielded little of archaeological interest. Similarly, within a 5m by 2.2m trench in the nave, there were no structural remains, merely disturbed burials and recent artefacts within modern debris at least 0.7m deep. 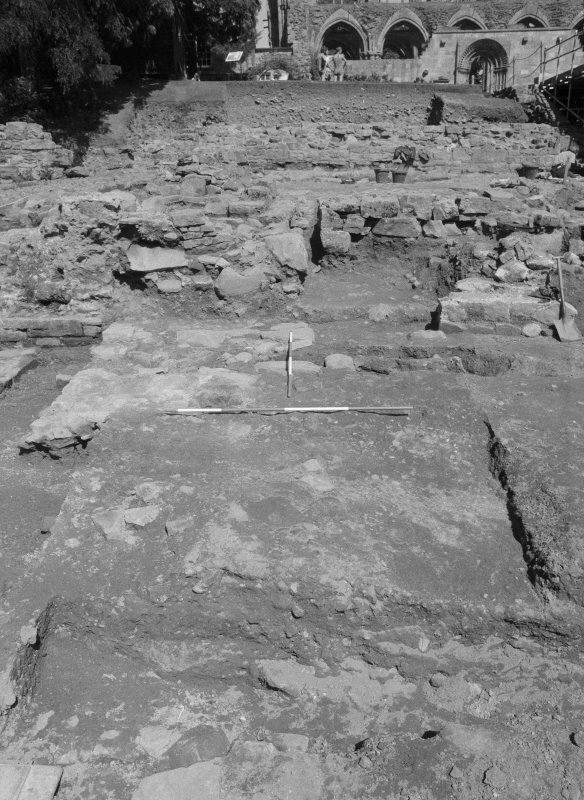 However, substantial masonry structures as well as several burials, some of them relatively undisturbed, were uncovered within an L-shaped trench in the presbytery. 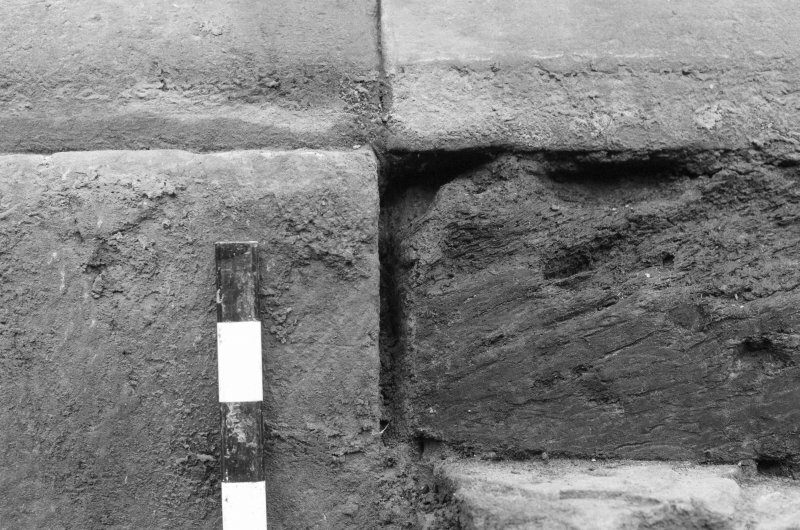 A plinth of mortar-bonded masonry measuring 4.4m by 2.3m and separated from the presbytery walls by gaps of 1.4m and 0.7m, has been interpreted as the probable base of a high altar. 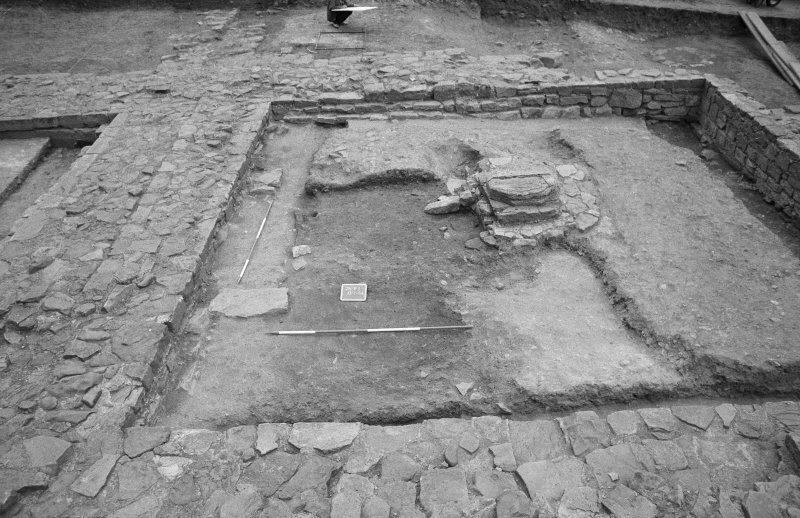 E of the plinth, but distinct from it, were the 1.2m wide rubble foundations of a wall: although only partially exposed and damaged by a modern drain, this appears to be the primary E gable of the church. The wall was straight and not, as had been thought likely, apsidal. It is not clear, however, whether this gable wall was contemporary with or earlier than the adjacent plinth. 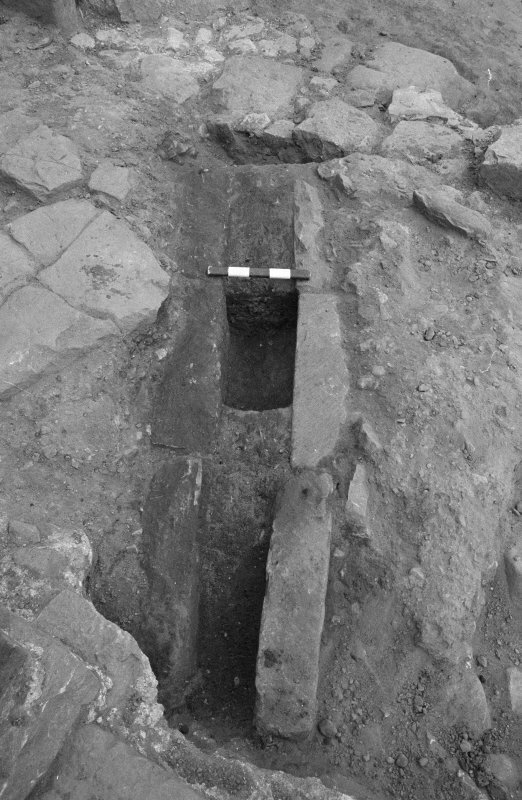 In the SW corner of the trench was a coffin comprising a lead box surrounded by timber planking. Attached to its exterior were some textile and thin beaten copper, the latter fashioned into shell-like patterns. Inside was a well-preserved, articulated skeleton with some hair still attached to the skull. Although its lid was missing, the coffin's construction and the skeleton's state of preservation suggest the burial to be of late 18th or 19th century date. Immediately below this grave was a stone sarcophagus similar to many of those discovered during the excavation of the chapter house in 1984. 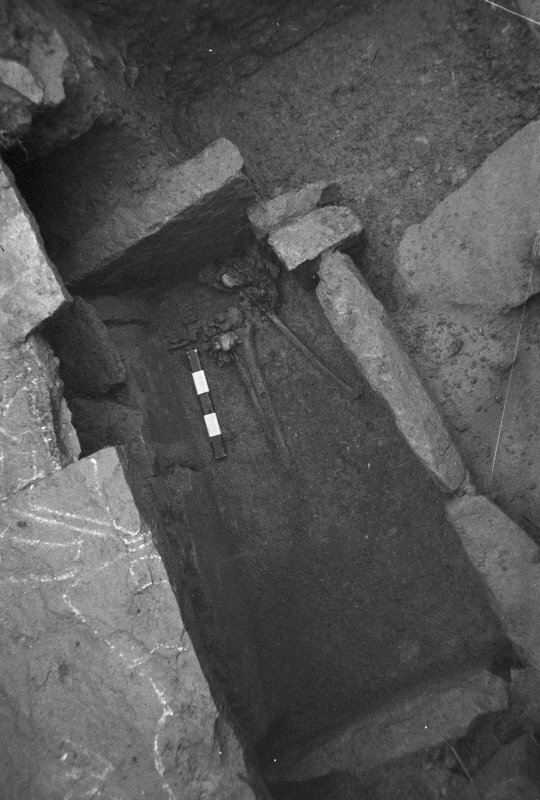 This earlier coffin had been damaged and its skeleton disturbed, probably when the overlying grave was dug. There were more graves, some disturbed and some in situ to the E of these burials. None has been excavated. NT 650 203 The removal of gravel and underlying deposits was monitored in October 1999 in the S choir aisle in Jedburgh Abbey. The area was to be paved in order to facilitate wheelchair access. An additional hole was dug outside the SE corner of the S choir chapel in order to unblock a rainwater drain. The earliest context encountered within the S choir comprised the sandstone foundations for the 12th-century pier forming the corner junction between the S choir aisle and the S transept. The interpretation of a stone feature at the base of the SE crossing pier was less clear. 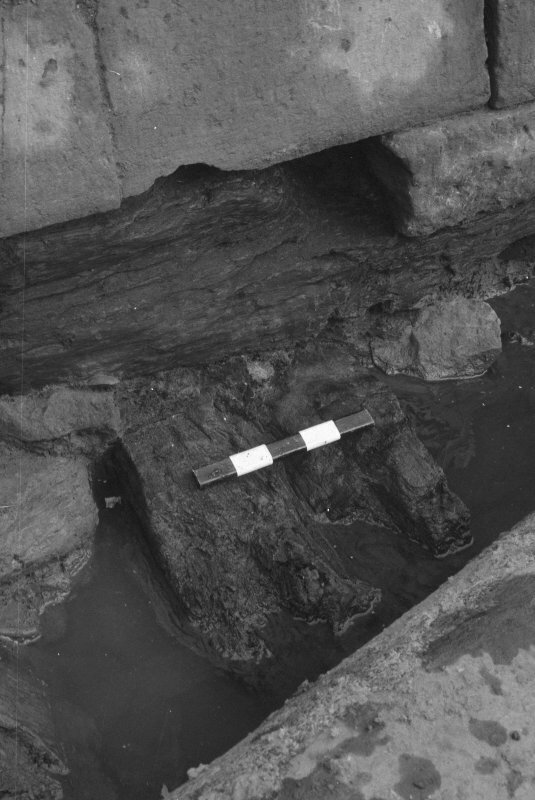 It does not appear substantial enough to be part of the pier foundations, although it might have been part of a hurried attempt to repair or prop up the base of the pier; the floor level appears to have sunk under the weight of the stonework. Another possible interpretation is that this is a remnant of a cross-wall keyed into the base of the pier, forming part of the E side of the first post-Reformation parish church. 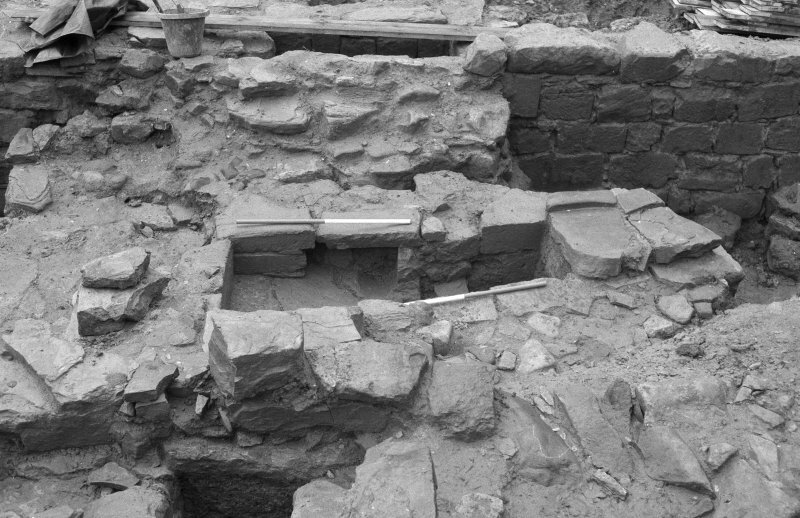 No deposits of significance were disturbed in either of the areas excavated. The layers removed in the abbey church support the conclusion that there has been wholesale disruption of the floor levels within the building. The structural remnants at the base of the piers in the S choir aisle were left in situ and will be avoided when the new pavement is laid. NT 6505 2045 A watching brief was undertaken in February 2005 during the removal of two bodies from the Victorian period burial plot of Nicholas Dodd to permit the reconstruction of the walled plot which had become derelict and at severe risk of collapse. The emptying of the plot permitted an examination of the graveyard deposits, as well as the complex repair and part rebuild of the N choir chapel E wall. The burial plot was positioned within the E part of the graveyard in the angle formed by the E side of the demolished N choir chapel and the N wall of the presbytery. This area has been landscaped with imported earth, levelling up the old monastic ground surface by c 1.5-1.7m. Additionally, at some stage after the graveyard was created, the wall face of the abbey was cleared down to the original ground surface, creating an E-W trench, 1.8m across and 1.6m deep, running the length of the outer face of the presbytery N wall. This in turn has created a revetted bank holding up the graveyard main fill. It was into the W end of this revetted bank that the stone-lined burial plot was cut. NT 6503 2044 A watching brief was undertaken on 14 May 2008 during the excavation of a small trench at the E end of the Nave where there is a step down into the Crossing. 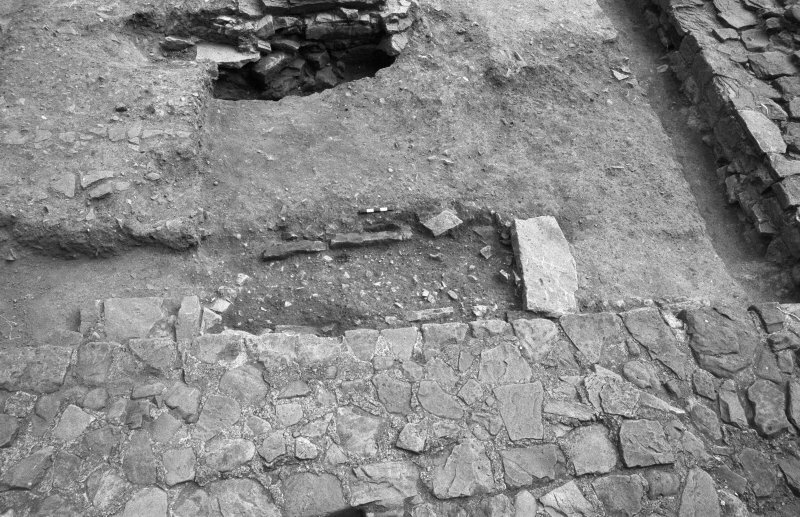 The area appeared to have been disturbed during the laying of slabs in the 1990s. 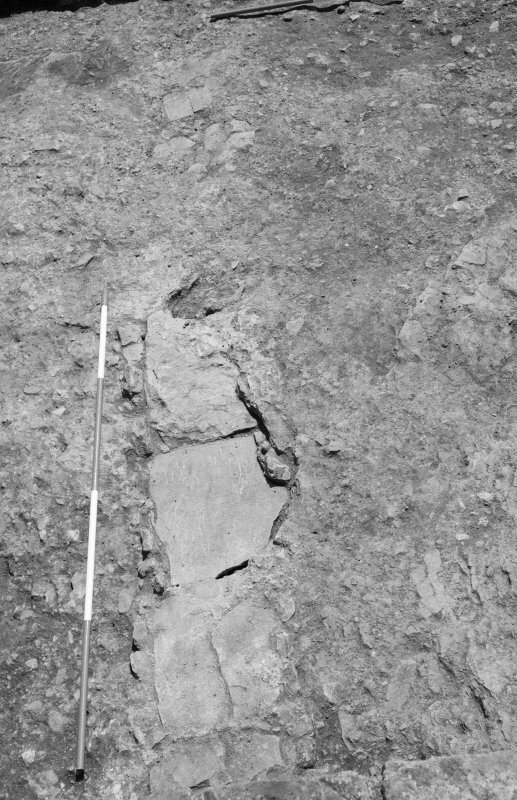 A lower deposit contained crushed sandstone, perhaps the remnants of an earlier floor surface. 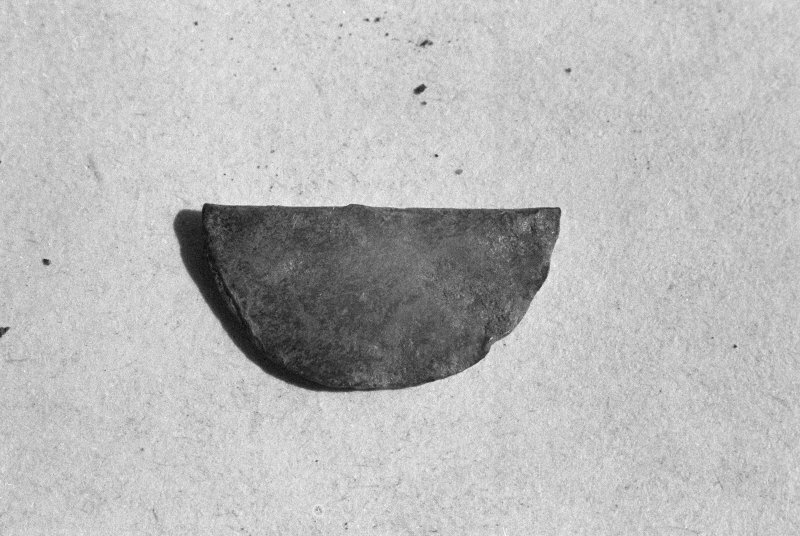 Human bone was also seen, although this appeared to have been redeposited in a mixed deposit containing relatively recent earthenware. basal rubble rich deposit may represent immediate postreformation demolition or later clearance. Abbey. 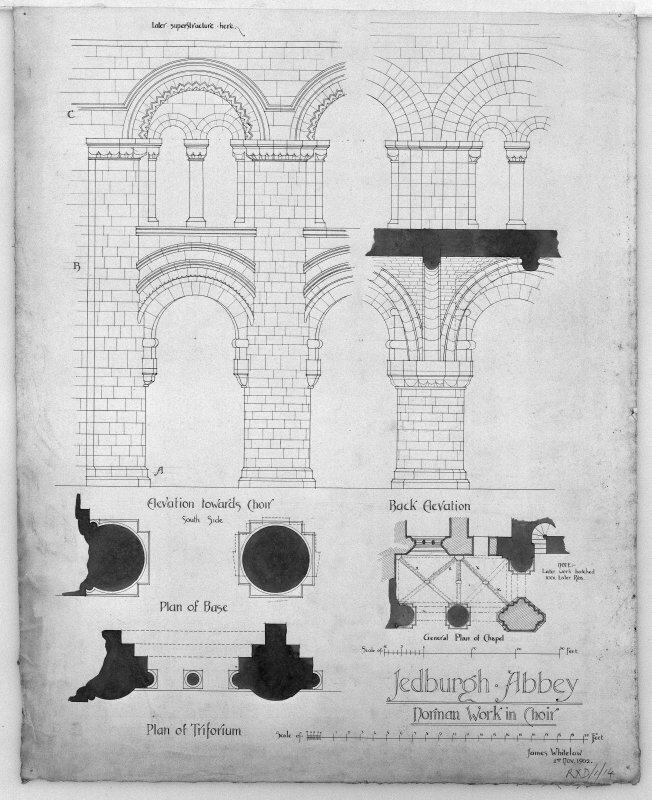 The sketch is dated 1863.
by J. Ainslie, Edinburgh; and Two Sketches of Jedburgh Abbey Church. 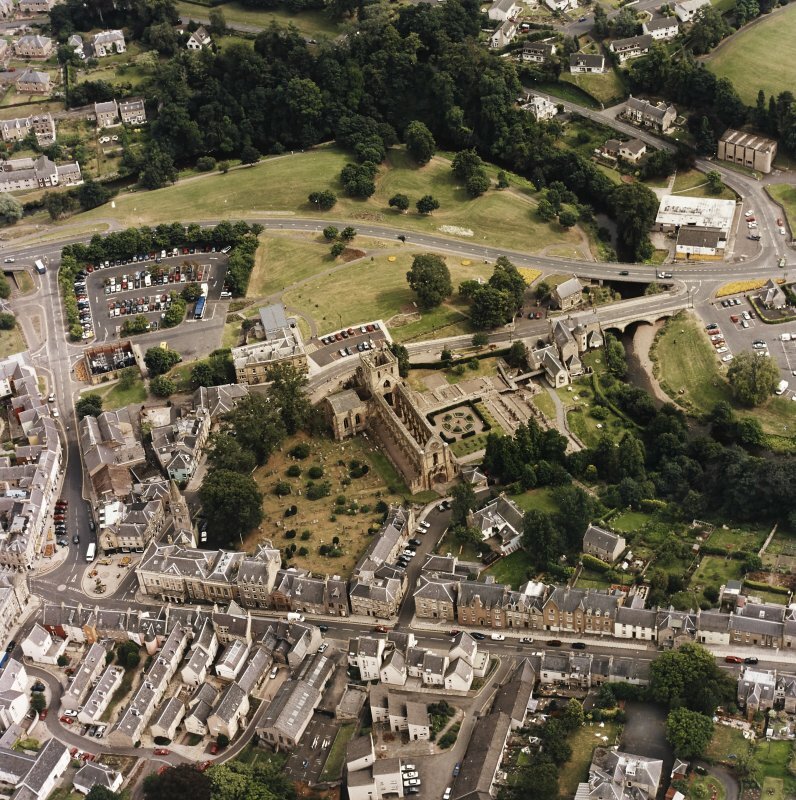 SMC was obtained for the evaluation of the Ramparts, Jedburgh. Trial pits behind the rampart walls at Jedburgh Abbey have identified the structure and nature of the rampart wall, whilst also identifying an episode of infilling or dumping behind the rampart wall that likely dates to the early 19th Century, which in places contains re-deposited skeletal remains of both humans and animals. 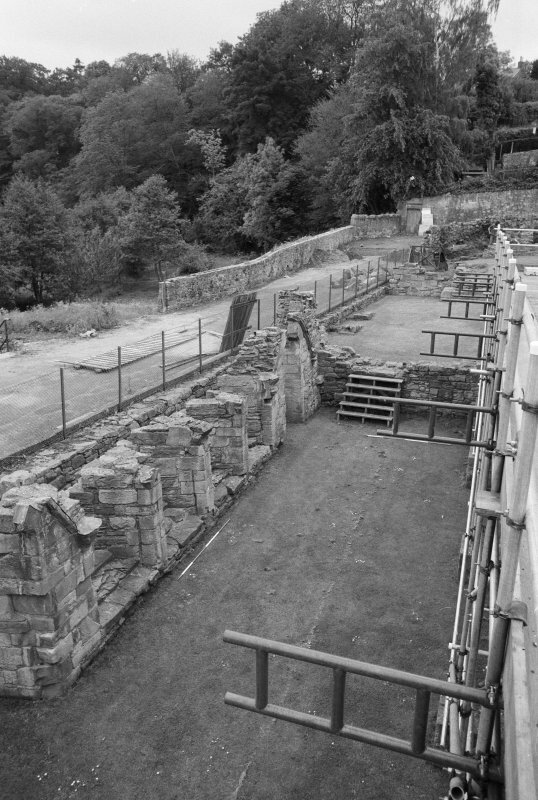 There is no evidence to suggest an earlier retaining wall for the ramparts set back from the current retaining wall, as had been postulated during the initial investigatory works. Prior to the infilling/dumping episode, the rampart wall may have acted more as a dry stone boundary wall, without retaining as much material behind it as there currently is. The wall was either rebuilt entirely, or modified to its current guise with a dry stone rear section and mortar bonded front face in the early 19th Century, creating a more formalised retaining wall. No in situ archaeological features were identified during the excavation works, with the deposits identified being indicative of a 19th century landscaping event.